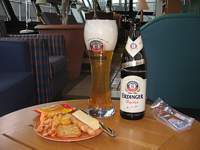 NEWS: British Airways is steadily closing lounges at many European destinations, and using the standard contact lounge at these locations, particularly in Germany.Airports without a BA lounge now include the previously excellent BA Dusseldorf Lounge (the Hugo Junkers Lounge is used instead), BA Cologne lounge, BA Frankfurt lounge (the Japan Airlines Sakura or the Cathay lounges are however good), and BA Hamburg lounge (use the Hamburg Airport Plaza lounge), BA Copenhagen lounge (try the CPH Apartment lounge), BA Istanbul lounge (try the very busy Prime Class lounge), BA Vienna lounge (the Jet lounge is now used) and BA Oslo Lounge (the airport OSL is an OK alternative). 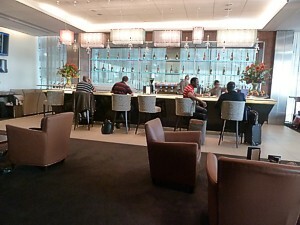 British Airways Business Class and First lounges are some of the best of any airline - at least for atmosphere. Get into one, and you won't want to leave - indeed the staff sometimes report that people miss their flights in the cosy world that is a BA Terraces or Galleries Lounge. They are similar to the lobby of a good hotel, with a plentiful supply of drinks (and naturally with a free bar: there are no bar tenders or vouchers needed in a BA lounge), although food can sometimes be a bit lacking), different areas to sit in (quiet and working areas, squashy armchairs and dining tables) great bathrooms, free magazines, and normally with working areas that have computers and internet access. 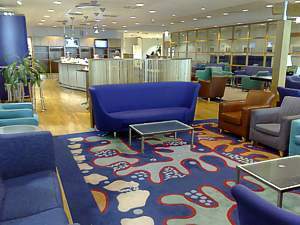 To access the lounges, you need a Business Class (Club Europe or Club World) ticket, or with Silver or Gold British Airways Executive Club Cards, and their equivalent on oneworld. For domestic lounges you are admitted with a fully flexible domestic ticket. Oddly, you can also buy access to the QantasClub, which is the only way of buying access, without buying a premium cabin ticket. At three lounges there is a Spa. A delight to enjoy, you can get a 10 minute circulation therapy, a shiatswe massage, a steam and shower suites, and a "face the world" colour bar. They are open to people travelling First, club world and BA Premiers and Golds. Other oneworld emeralds, silvers, and people travelling in club Europe are not entitled to a treatment, however on a Silver card you can normally get access to the showers. Galleries Lounges These are the new lounges, with an uprated bar, and trendier seating. These feature a long thin bar with a curved end, over which is some fancy sparkling artwork. Terraces Lounges These are the old outstation product, and try and resemble a good sitting room mixed with a pleasanty middle class garden in Surrey. There are different areas with sofas to lounge around on, the classic blue tiled curvey bar with a trough for wine and bar stools. And initially most perplexingly, wooden garden chairs on stone floors around fountains. Incongurous, and yet this idea of the outside meeting inside is very calming and works well. 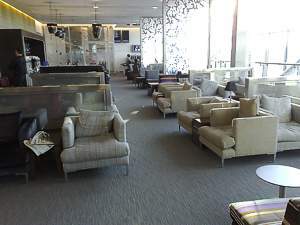 Terraces Lounges are open to Club, Oneworld emerald and sapphire passengers, and Qantas club members. Lounge Pavillions These are the giant lounges at BA's main hubs. A more businesslike lounge, there will be plenty of desks and generally internet access. The World Wine Bar in these lounges is vast, with a dozen or so to try. 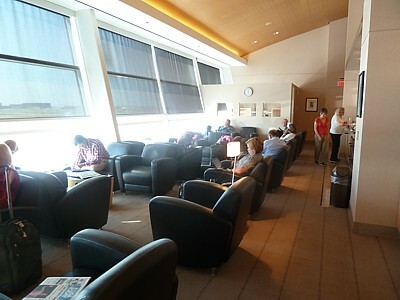 There may also be a Library and Quiet Area (at LHR and JFK only), plus a free travel spa (longhaul at JFK only). These are slowly being closed. Executive Club These are the old lounges, and are rapidly being replaced. They are rather old and tired, and now little remains of these, although you may still see some signs for these at old outstations. First. 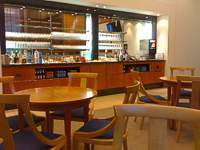 These are the top quality lounges, with vastly better spirits, and often food that is better than the snacks in the Terraces Lounges. Think deep leather armchairs, a full service bar, a canapé service between 1700 and 1900, and bottles of Sparkling Wine. You get the lovely perk of pre-flight dining with waiter service, from LHR (from 8pm), JFK, Newark, Philadelphia, Washington, Toronto, Chicago, and Boston. 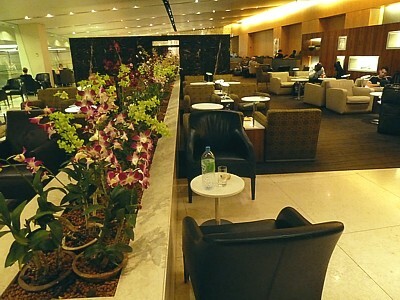 The First lounges are open to people travelling first class, Golds, and Oneworld emerald passengers. Oneworld emeralds are allowed one guest. Concorde Room. Travelling in First? Then at LHR Teminal 5 the Concorde Room awaits. 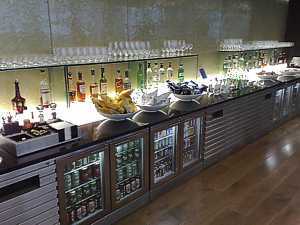 Definately the elite, the Concorde Room and First lounge have the same snack menu, but booze is slightly better in The Room. The big difference is the pre-flight dining, and it always seems more peaceful. The First lounge can sometimes really get very busy (although when you are at this sort of elite level, another passenger is hassle indeed). Arrivals Lounges. 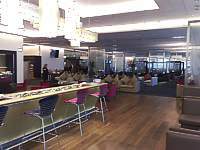 At London Heathrow, Gatwick, and Johannesburg there are arrivals lounges. 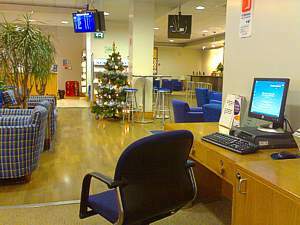 Around Europe dedicated lounges for BA can be found at Amsterdam (Open 0600-2100), Athens (0530-2030), Berlin (0600-2030), Brussels, Budapest (0730-1600), Dusseldorf (0530-2100), Frankfurt (0600-2230), Geneva (0600-2015), Hamburg (open 0530-2030, no access to Club Europe), Istanbul (0645-1900), Munich, Milan-Malpensa (0600-2000), and Milan-Linate (0600-2000). The Copenhagen and Oslo Terraces lounge have now closed. 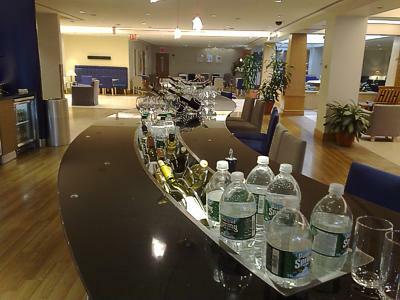 In America there are dedicated BA lounges at Atlanta, Barbados, Boston, Chicago, Miami, New York (JFK), Philladelphia, San Francisco and Seattle. In Africa & Asia BA have dedicated lounges at Cape Town, Dubai, Johannesburg, and Mumbai (Bombay - no opendoor access for Gold members). 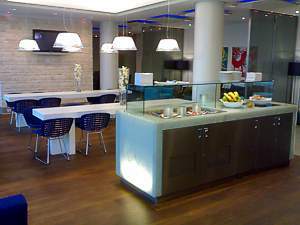 British Airways have changed catering contracts for the lounges. 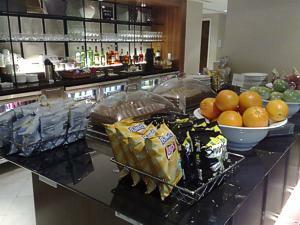 Baxterstorey have now taken over supplying food in all UK BA lounges. This has resulted in a severe downgrading of the food available. 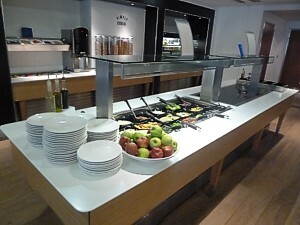 At London in the Club (Silver) lounge, hot food is no longer available all day. There are just bacon rolls 0500 until 0930, biscuits porridge, toast, croissants and Danish until 12. Until 1500 there are basic 'tray of slops', (Pasta with basil and tomato sauce, Mustard chicken, Beef Bourguinon, Red Thai vegetable curry, and Chilli con carne). These reappear after 1800. In the First (Gold) lounge The made to order menu is far less extensive and the variety of hot food is basic 'gloop' or jacket potatoes. NEWS: British Airways now only operate out of Terminal 3&5 at Heathrow. The main operations are at Terminal 5, where there are seven lounges, and there is a further small new Galleries Departure lounge at Terminal 3. Heathrow is BA's main hub, and with the introduction of Terminal 5, most of the flights fly from this terminal. Accordingly, the are lots of lounges there. There are also some flights from Terminal 3 (the Spanish and Australian stuff), so BA have a small Business and First class lounge there. British Airways has moved into it's new home at London's Heathrow Airport, Terminal 5. The new lounges are called the Galleries, and include the Main Galleries Club (for Club World & Silver) with a Food Court, terrace viewing area and bar, and two "Silver" Bars. 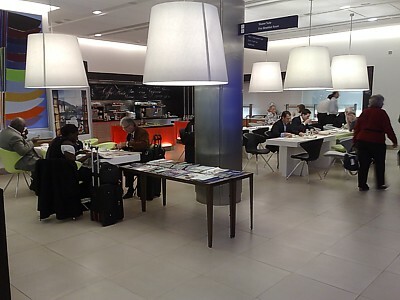 A Mini Galleries Club at the northern end of the terminal (mainly for Club Europe travelling shorthaul & domestic) and the Satellite Galleries Club in the T5 Satellite. There is a Galleries First (for Gold Executive Club members) with a Sparkling Wine Bar, "Gold" Bar and Wine Gallery, and Concorde Room (for First class pasengers) with Cocktail Bar, Private dining area, private cabanas and terrace. There is also an arrivals lounge. South Gallery, Mid level When you start your day lounge hopping at Heathrow, you need to first of all make your way to the central complex of lounges, at the southern part of the terminal. After checkin (there is only a special checkin for First and Gold card holders - all others much use the machines) and security, it is a bit of a trek. Go down the escalator and follow the signs to Galleries South, then up the escalator, and turn right. You are now at the middle of the lounge complex. The Concorde room is on the right, the Travelex and Spa are ahead of you, while the First lounge is on the left, and the Galleries for Business and Silver are up another escalator. 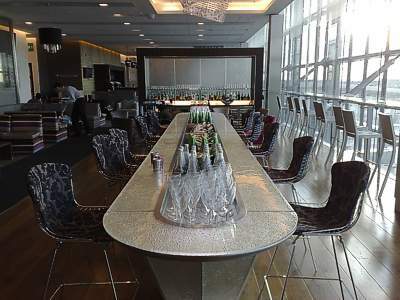 If you are flying in First Class from Heathrow Terminal 5, oddly, you don't want to head to the First Class lounge. 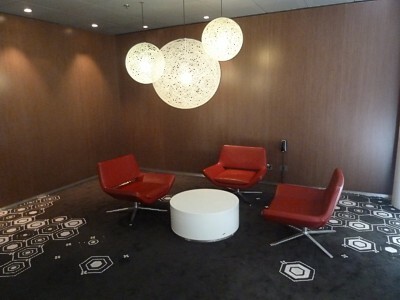 That lounge is designed for oneworld Emeralds – although you can head here if you wish. Instead, the elite of the elites go to the Concorde Room. Firstly, check in at LHR Terminal 5 at the exclusive First Class check in area – with white walls, off to the right of the main concourse. Here you can get the exclusive First bag tags for your checked and hand luggage. Then, when you are through security (use the Fast Track security line on the right), you can turn right for the hidden door into the lounge. There is normally someone on a podium here stopping the great unwashed in Business from entering by this route. And then – you're in, into one of the most elite lounges on any airline. The Concorde room has a kind of subdued hush, but then again when you are flying at this kind of elite level, another passenger is hassle indeed. The lounge is split into two: inside and outside on the balcony. 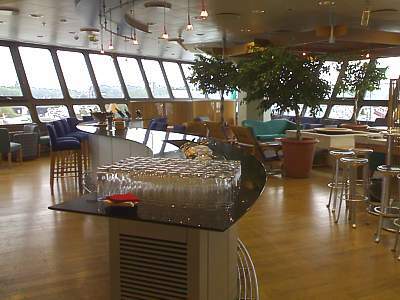 As soon as you enter on your left there is the bar, while the Concorde Dining restaurant is on the right. There are plenty of seats here, or you can sit on the middle bar, by the imitation fire, or in squashy armchairs. Most people however head to the balcony, and this is where the Concorde Room comes into its own. The balcony is very exclusive, looking down on the simple Gold balcony below, and indeed in the far distance the general hoy-paloy of the airport. It is of course still inside, but the views of the runway and the gates are superb. There are a couple of loungers here, as well as sofas around coffee tables. It never seems to busy; indeed it is the most relaxing part of the airport. Concorde Room Food is very good indeed, as you might expect. Indeed, you can generally expect many people to be indulging in pre-flight dining here. There are two options. The Concorde Dining Room (Restaurant) is five star, with excellent wait staff who will take your order. The Burger is particularly recommended, as is the Eggs Benedict. Of course you can get your traditionally breakfast time Bacon Butty (which is served all day) and you can also get a traditional British Afternoon Tea. You don't have to eat in the ‘room if you don't want to, and many people prefer to take afternoon tea on the terrace. Of course many passengers are here for the bar. If you want, the butlers can bring you Sparkling Wine, however most people walk up to the bar. Unusually, there isn't actually a walk-up serve yourself bar here. There is usually a choice of two or three vintage Sparkling Wines, one of which is normally rosé, while the wine list goes on forever. If you are after a special wine, most of the selection are on the top of the bar, around the guest book. One fau'par that a few US passengers make is it to try to tip at the bar. Do not ever do this. 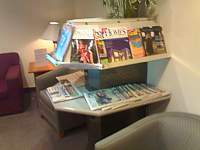 There is usually a vast rack of magazines in the Concorde Lounge, from Country Life to GQ, and of course every UK newspaper (except the Guardian) and a fair few from abroad: mainly US papers. 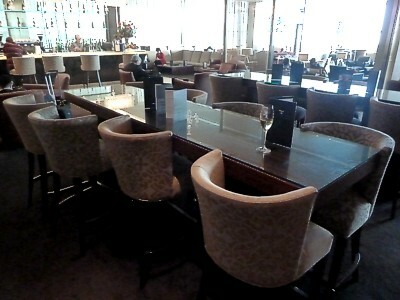 The magazines are held on two large tables, one by the conceige desk, and the other between the bar the the terrace. There are of course Computers, which are neatly tucked away in the Boardroom. The eight in here are fast and good, but ever so slightly crampt, and it can often be a problem getting hold of one. There is also a combined fax and photocopier in the boardroom. Sometimes people try and hold meetings in here too, but in fact the room is open to anyone. While you are here, look at the chairs, which are genuine Concorde chairs, taken straight off the plane, upholstered in Connolly leather. There is also WiFi. It is free, but you will need a password, which is usually displayed within the lounge. There is of course a left luggage area within the Concorde lounge. It is just to the left as you come in, and the left luggage area will happily hang onto your bags if you want to go shopping: just remember your boarding card, as it can be very difficult to get back into 'the room' without it. Finally, when time comes to leave the lounge, check the gates carefully. If you're unlucky you'll have to go from the B or C satellite, which means much less lounge time, however you can generally time it just right to leave the Concorde room 20 minutes before the doors shut, because as a real First customer you can of course use priority boarding. If BA forget to do this and there is just one snaking line heading towards the gate, ignore the rif-raff in Business and walk to the head of the queue. Your first boarding pass will get you onboard instantly. 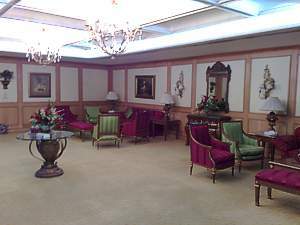 Contrary to expectations, the First Galleries is designed for passengers with a Gold executive card - genuine First Class passengers are accommodated in the Concorde lounge (with access via the hidden white door after Security South). 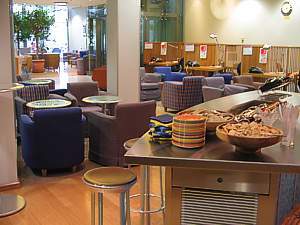 The First lounge itself is on the lower level of the lounge complex, at the South side of the building. There are twin desks as you go in - and then you pass the two famous statues of the "horse with the lamp". If you need to know what this is, you have not got a First Class ticket. The lounge is lovely. It is underneath the Southern Galleries lounge, on the South side of the airport. Do take the time to explore, because there are several bars, and a hidden area down a corridor, plus the famous terrace viewing area and bar. The best impression is the stunning view to the southern LHR runway. 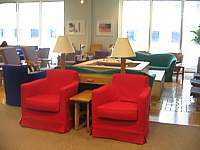 Starting in the main area of the lounge, as you walk in, there is the main rectangular box that has neat, comfortable, armchairs separated by glass panels. Contemporary British Artist Christopher Pearson has created several pieces for the Galleries. These laser etched glass panels were inspired by the four seasons, and describe the growing circle of the English Oak tree. If you walk over to the left and through the double doors, you are on the famous First terrace, where you can relax in white smooth leather couches with a glass of Sparkling Wine. There are two highly prized sun loungers here, right by the door, with a great view, which has to be my favoured place in any of BA's lounges. There is also a fireplace on the terrace, with some very comfortable sofas. Back in the body of the lounge, down one arm (back behind you as you go in) is the Refectory & Deli. Prepared to be a little bit disappointed about the offered choice of meals, because there is no remarkable difference to the Galleries business lounges. Indeed, compared with the former Terminal 1 First Class lounge food is poor. It seems, BA twigged that most of the people in First were infact on Gold cards - so they've moved real first class passengers to the Concorde room, with accordingly better food. Down the Refectory arm (oh, it is so public school) there are three fridges and the main food galley at the bottom. Here you can get a bacon or mushroom roll til Midday, and then either pick at the salad bar, or order from the Menu. If you call over a waitress you can be offered Soup, Ceaser salad, Pasta, Pies, panini, or tarts with veggies. There are several bars. 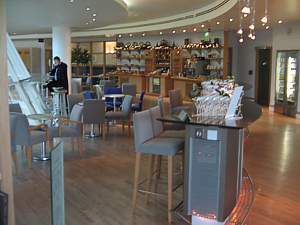 The main bar is part of the Wine Gallery, in the centre of the main section overlooking the Southern Runway. Here there are several wines, but they are noticably a bit poorer than of late, with a couple of midling whites and a dodgy red. Meanwhile the Gold Bar (for all those Gold executive club members flying on cheap economy tickets) is to the right of the main section. Here, there are the spirits (on the far wall) with 14 different spirits. Johnnie Walker red (no Blue alas - that's now only in the Concorde lounge) is there, plus Tia Maria, Campari, Southern Comfort, JD, Bacardi, Smirnoff, Martini, and London gin. The Sparkling Wine Bar is tucked away up the corridor to the side (bear right and right again), and is a small intimate space, with small tables around high padded walls, plus sparkling Swarkoski chrystals, but the choice of Sparkling Wine is restricted to an adequate premium white and rosé blend. There is also the Terrace Bar, on the terrage, overlooking the shops, but oddly here you only get a choice of beer - and it's just BA's standard selection of Carlsberg, Heiniken, London Pride and Newcastle Brown. There is a Coffee House near the Sparkling Wine bar, with pretty good variants of coffee - all machine made of course. The Work and Entertainment Zone (called W+EZ)is tucked away up the corridor to the side (bear right and right again), then left at the Sparkling Wine bar. There are 44 computers in the lounge, racked around the walls, and a photocopier in the middle of it. There are also a couple of plasma TVs (showing CNN and the BBC News Channel) next to the screens with departure information. 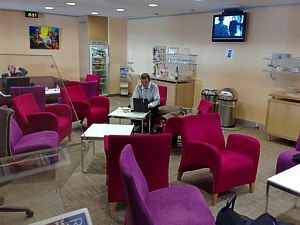 There is free-wifi in the lounge, and several racks of newspapers with a full selection of the UK's daily papers. Magazines are much better in First than upstairs in Biz, with Conde Nast traveller and Wallpaper among the selection. A Kids Zone (designed by El Ultimo Grito) is tucked away past the refectory, offering toys and games for the under fives. There are 20 shower suites beside the Elemis travel spa, outside the lounge. 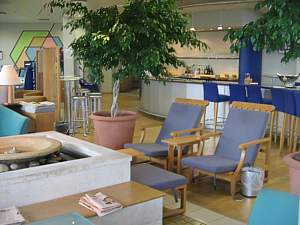 This lounge is found up the escalators from the intermediate Spa and First level. Turn right and you'll go through the ticket office style desk. 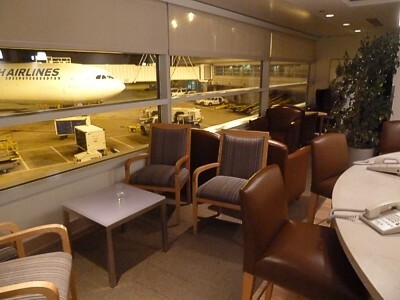 This lounge is the main business class lounge, above the First lounge, and it has a great view of the Southern runway. It is however not as big as you'd think - in business a lot of passengers are Gold card holders, so they'd be downstairs. The Galleries Club gets sofa type benches, as opposed to the armchairs in First, but other than that the differences between First and Club aren't as big as they were at Terminal 1 or 4. 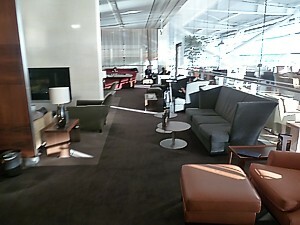 Imagine the lounge as one big rectangle, into which you come in half way along, opposite the food section. There are good newspaper racks here. On the left is the main seating area, with posters from BA's past. On the right hand side of the arm there are more seats, in long benches, in a lovely shade of brown - definately a bit retro, but looking a bit dated. However here there is a good view of the main terminal shops, and the Gordon Ramsey restaurant in the distance. There is one main Silver bar in the middle of the lounge on the left. It has BA's new signature of a long thin bar with curved round ends - the wine is in the central trough. Against the far wall are six fridges, containing Carlsberg, Heiniken, London Pride and Newcastle Brown, and 13 types of sprits are on the wall. The chairs at the bar are notorious uncomfortable. 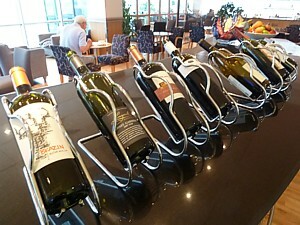 There is also a wine bar next to the food section, with idential wines to that in the Silver bar, in six silver buckets. Food is in the Chef's Theatre, where you can see the food as it's being prepared in the kitchen, but alas you can't order it. 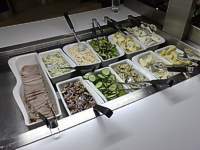 You are stuck with what is on the buffet, but in the mornings it's quite good with bacon rolls and crossants, while by 11am there is a full salad bar. There is a cinema on the left hand side of the lounge, with very comfy seats, and usually it is deserted meaning you can flick the telly onto whatever you want. Past this there is a good coffee house. There is one main newspaper rack, with pretty much every paper you'd expect in the UK, and some international ones. There are however few magazines. South Gallery, Mid level Open 0500-2230 There are full spa facilities in Terminal 5. Sadly no longer Moulton Brown, it's now Elemis which takes over the mantle of providing soothing and pampering. And in some style too, with everything from simple showers, to "intensely" (sic) relaxing massage chairs, massages and a range of treatments. Just ask for the menu of what's on offer. There is even the Spa bar, offering products to keep you feeling great throughout your flight, including tailored prescriptions. NEWS: British Airways have severly downgraded of the food available. Hot food is no longer available all day. There are just bacon rolls 0500 until 0930, biscuits porridge, toast, croissants and Danish until 12. Until 1500 there are basic 'tray of slops', (Pasta with basil and tomato sauce, Mustard chicken, Beef Bourguinon, Red Thai vegetable curry, and Chilli con carne). These reappear after 1800. In the First (Gold) lounge The made to order menu is far less extensive and the variety of hot food is basic 'gloop' or jacket potatoes. This lounge is found, appropriately, at the other end of the terminal from the Galleries Club South. But your first task is actually to find it: if you are on the ground floor, you need to take the lift upstairs, and then find the small door on the right: signposting is particularly poor. 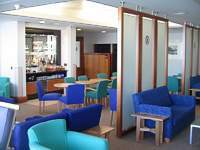 Appropriately, this lounge is designed for passengers flying North on the few remaining BA domestic services to Scotland, plus for Club Europe travelling on the shorthaul network, and the domestic flights. As a result this lounge has many more Scottish and European newspapers than it's southern cousin, and the wine and food selection can be marginally better. 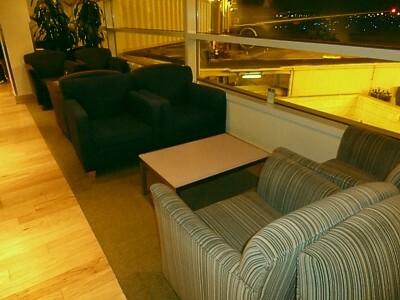 The major perk of this lounge is the Club Terrace overlooking the terminal below. 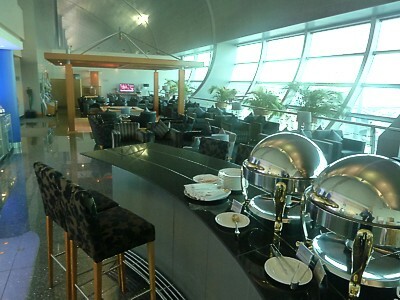 The lounge is vaguely T shaped, with a long thin top of the T, that has a great view overlooking the Northern runway. As you enter, there are the newspaper and magazine racks, and then you walk past the coffee House, and the wine gallery, with the Club Kitchen on your right. If you turn right you'd go through the double doors to the Terrace. If you go left, there is the silver bar, another magaine rack (often fuller than the ones by the door) and the business centre at the end. 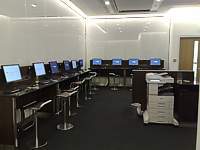 This Work and Entertainment Zone (called W+EZ) has 12 brand new Internet computers, with headphones, all connected to one central printer, plus a photocopier and fax. 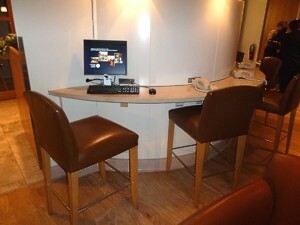 There are sockets for European and US plugs, and a TV on the wall (normally on Bloomburg). Past this are the showers. 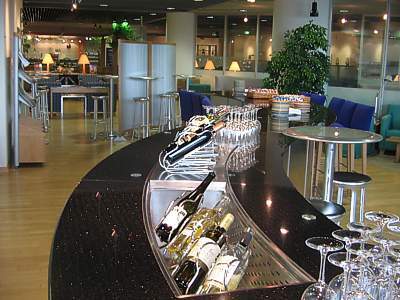 The one main Silver bar is in the middle of the lounge, overlooking the Northern Runway. It has BA's new signature of a long thin bar with curved round ends - the wine is in the central trough, and the selection often has wines that are now in the Southern cousin. Against the far wall are six fridges, containing Carlsberg, Heiniken, London Pride and Newcastle Brown, and 17 types of sprits are on the wall. There is Gordon's Gin, Smirnoff vodka, Bacardi, Jack Daniels, VSOP, Johnnie Walker (Red), Jamesons, Southern comfort, Grouse, Glenlivett, Campari, Martini (2 types), Tia Maria, Drambuie, and Contreau. 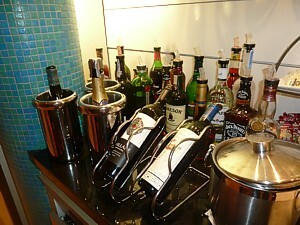 Port & Baileys is in the trough on the worktop, along with 5 types of juice and packets of nuts. Food is in the Club Kitchen. The menu is painted on the wall, with Breakfast from 0530 to 1200. It's quite good with bacon rolls and crossants, yoghurt, and fruit salad. At 1200-1400 and 1700-1900 there are hot dishes, in the trays under the hot lamps. These can be quite good, with generally a chicken curry or some meaty pasta. From 1400-2200 there is soup, salad, cold meats and cheese. Over in the Terminal 5 Satellite there is yet another lounge, which is a combined Galleries Club and First Class lounge in one, but there are few first class facilities except for the excellent spirit selection, and slightly uprated seating. It's always had a bit of a lost at the end of a long terminal feel, a pit stop before the main event: the flight. And that's because it is. 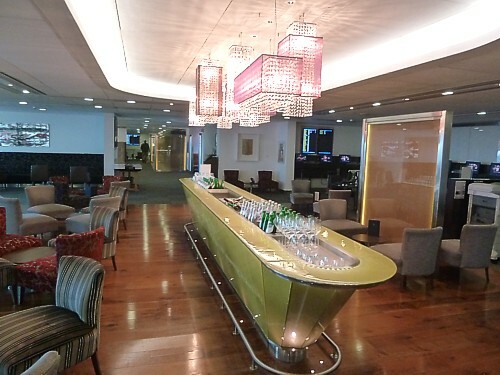 Most passengers spend much of their time in the main lounges (Gold, South and North) and only make it to the Satellite when their flight is about to depart, popping into the lounge for another quick snifter to prep for the long long haul to New York. You get to the lounge via the escalator in the middle of the terminal, or via the lift, for the lounge is long and thin, occupying much of the top floor of the satellite. After you enter past the toll booth, there is a small seating area, with computers and showers to your right, and the children's playroom to the left. Ahead, over the other side of the central divide is the food area, a bar, and on the far left lovely squash seats overlooking the great unwashed below. This is by far the most fun part of the lounge: you can look down on those in the cheap seats underneath you. Power sockets (including 110v ones on US plugs, and 240v on Euro sockets) are in the central island between the seats. There is an assumption that you'll already have eaten before you get to this lounge. Sure, there is some food available, but it is nowhere near as good as that in the main lounges. The bar however is superb: somewhat less wine than in T5 First, but more spirits: again, with the assumption that passengers here are in a rush. There is also a very good coffee bar, and although the machine that makes the coffee is quite noisy, it is very welcome before early morning flights. Just press the button on the machine, and it makes a half way acceptable black coffee: alas the milk here comes from powder, but if you select no milk, you can then nip around to the fridge to put real milk in. Noticeably there are excellent piles of magazines and newspapers, designed to be taken onto a flight, and also very good computer facilities, called W+EZ (the Work and Entertainment Zone), right by the entrance, which are almost always deserted, including a fax, and photocopier. There is a small Shower section past this, and there is rarely a queue here, if only because most people use the spa facilities by the main entrance. At London Heathrow, British Airways have an Arrivals lounge in Terminal 5. This is very welcome if you've come from a long-haul flight, as it give you a chance for a wash and a feed before heading onto the tube back to the office. However, it is very small, and access is very tightly controlled. To get to the lounge once through customs turn left, and go up the escalator, and after one flight turn right to get to the Arrivals lounge. Access if only permitted for passengers in First Class and Club World. Gold Executive Club members are also permitted in (no guest) if they have come off a long haul flight in economy, but that's it: no access for oneworld, or Silvers. The British Airways Galleries Arrivals lounge in LHR Terminal 5 is different from a normal lounge. There is no booze for example, but there are racks of newspapers, and a vast number of shower rooms. As you go in there is the main dining room (in First Class you can turn right to the private Breakfast Room for waiter service) right from here are the main lounging areas, with similar seats to upstairs, but many more Televisions on the wall. Food is, as you would expect, breakfast orientated. 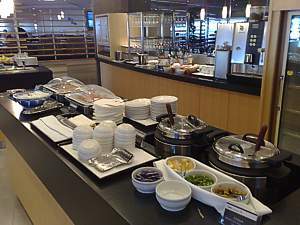 There is a full Buffet Breakfast Bar, where you can see the food as it's being prepared in the kitchen. If you want a full English, this is the place to get it, with very good bacon and mushrooms. If you want healthier options, there is melon and yoghurt too. But it is for the Elemis Travel Spa why most people come to the arrivals lounge. It has treatments designed for those who've been on a plane for 8 hours or more, including a Hydrotherapy area with a thumping 94 shower rooms. Don't just ask for a shower: there are three types, including full body jet, steam shower and a deluxe massage. While you're in the shower, there's a perk in the form of BBC radio - you can listen to the today programme by just turning the dial to position 4 on the shower wall. Finally, there are the cabanas, which has a new Infinity bathrooms where the water continually rolls through the bath and over the sides to keep it clean and fresh. On a slightly duller note, there are of course Internet computers, and piles of newspapers, with all the UK daily papers. There is also suit pressing. 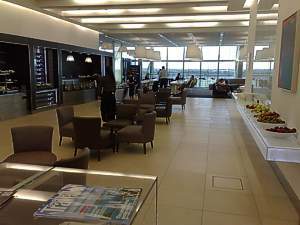 There are both Business Class (Galleries Club World) and First lounges in the British Airways outpost at London Heathrow Terminal 3. Indeed, lounge facilities are large and quite spreading, which is odd considering how few BA flights leave from Terminal 3 (and indeed, shortly none, when the new Terminal 5 satellite is complete). 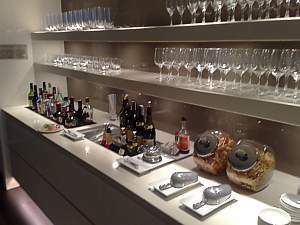 However BA also provide lounge facilities for Qantas, Iberia, and Finnair (AA and Cathay have their own separate lounges). This leads to some unusual peaks and troughs in demand: the First lounges for example are insanely busy late at night, before all the Qantas departures, while the Business lounges have a peak at 6am and 3pm, with Finnair & Iberia flights to Helsinki & Spain. Now that Qantas are cutting back on many flights, this is easing demand on the First lounge, but it can go from deserted to manic in just a few minutes. 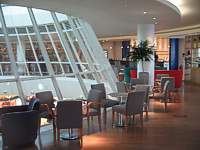 To find the lounges, when you are in the large oval centre of the shopping centre that is Terminal 3, walk between Bagel Street and Caffe Italia, up to the SAS lounge, turn right, then left, past the main Virgin Atlantic Clubhouse stairs, up the rather dingy service corridor, and through the blue door. Before you get to the lounge, it looks as if you are heading into the bowels of the airport, and it gives no hints of the delights within. 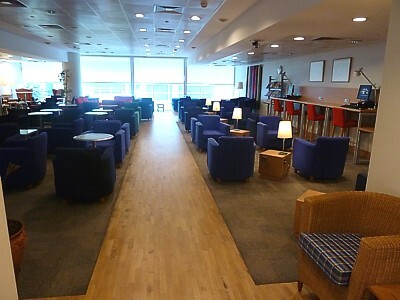 There is a complete British Airways Terminal 3 lounge. It has a slightly temporary air about it - and quite right, because it will only be here a few years - and feels like the afterthought it is - until the new Terminal 5 extension gets the go ahead. The lounge itself is pretty much like the Satellite Galleries over in Terminal 5, but with better dining (designed for the longhaul Asian flights) and a great bar (for the Finish and Spanish ones). 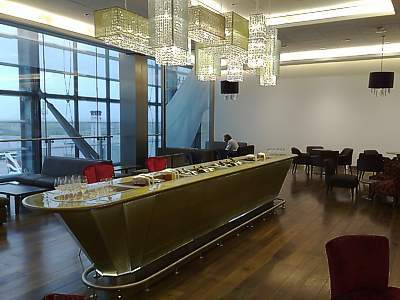 There is also a separate First Class lounge in Terminal 3, with full dining facilities. When you are through the blue door, straight ahead there are little toll booths to check your ticket, and then you walk along a long wide corridor with large armchairs separated by tall class screens. 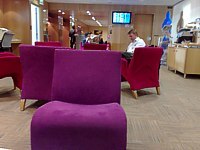 Occasionally you see people actually use these seats: they are generally lost, and haven't found the main lounge yet. When you walk into the main body of the lounge, you could be forgiven for thinking you are in the motorway service station crossed with a boarding school dining room. 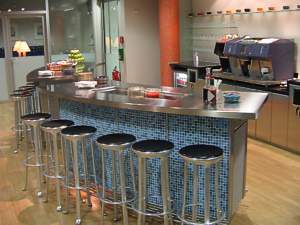 There are the large white tables for the food area, across from the cafeteria style troughs of stew, and passengers wolfing down the food knowing they will get little on their band 3 flights to Spain. Further on the lounge widens with computers on the right, and a great window view on the left, which has bar style seating overlooking it, and close to the wine bar with pairs of more comfortable seating. Finally at the far end is what you may have been hunting for all along, the long white island bar, under the crystal decorations. There is another bar making a T shape with this one, and curiously behind the far wall are a rack of more seats: these large squashy armchairs are by far the most private in the lounge. Terminal 3 British Airways Heathrow Galleries - the boarding school dining room. The lounge has a well deserved reputation for its bar facilities. They are superb. The long silvery bar has a chilled trough with white wine, although the mixture here can be a bit variable, and there are some days when only Chardonnay is put out, but on other days there is a full selection. Here are also the bottles of Baileys and port. At the back of the bar is the spirits selection: it's the usual BA selection of 18 different bottles of free pour Cointreau, Tia Maria, Campari, Martin (x3), 5 whiskeys, six vodkas, and Gordon's gin. There are three types of brandy in the middle of the bar, behind the pile of crisps. Beer is in the fridge below, with four types including Guinness and London Pride. Bar crawl facilities are pretty poor in the lounge, as there is only one other bar, on the opposite side of the wall to this one, in the middle room, and here wine dominates: there is also a fine selection of red wine here, with 8 types on decanters, in front of the sadly more expensive wine that is locked in the glass cupboard. Food is equally good, although it isn't displayed in the best possible way. The first room - the dining room - has the classic BA white dining room tables with three large alcoves along the left hand side. The smaller centre alcove contains soup, while the first alcove has breakfast cereals and juice: these are here all day, befitting the late night flights to Australia and the other confused time-zones of other passengers, who may have a body clock 12 hours out of sync. Just rotate the wheel under each vertical glass cereal container, and out drops your breakfast, hopefully into the bowl you're holding under it. Milk is in the fridge. The last alcove contains what has been called the "tray of slops". It isn't that bad - at least, not quite - but it really isn't all that appetising. There are big long trays with everything from Beef Madras to Goat Goulash, meatballs, pasta and rice. Next to it is a cooler tray with salad and cheese: make no mistake, this is not the quality or variety of food you'll get in Terminal 5, and late at night with the evening departures to Australia, the food here goes very quickly: if you want better options, nip next door to the Cathay Pacific lounge, where there are normally better options late at night. There is a very large computer centre in the lounge, called W+EZ (the Work and Entertainment Zone) it has 30 high spec PCs, around the walls and on glass tables. There are two large photocopiers which double as printers and faxes, and even a mobile phone recharging crèche. If you need to plug in your own laptop, press the plunger in the middle of the glass table and a column rises up, with sockets for power (including US at 110v) and network sockets. Newspapers are very good in the lounge, with a full selection of UK papers, and also Spanish, Austrian and Australian papers, although the Sydney Morning Herald and the Financial Review are normally two days out of date. There is no defined TV area, however there is a small widescreen TV in the dining room tuned to BBC 24, however it is on silent. There are three large screens with flight departure data in the W+EZ, wine bar, and silver bar rooms. If you're confused about why this lounge is here - and why BA are in Terminal 3 at all - the reason is simple: BA should have been able to bring in all of its flights together at the brand new Terminal 5 when it moved out of Terminal 1 and 4. However, it couldn't quite manage this, and so, yet again, it was stuck with a split terminal operation. To avoid confusion it put the Spanish flights here, so that there is no mix up with so many Iberia codeshares, but then bunged in all the Gibraltar, Helsinki, Lisbon, and Vienna flights. To make it even more confusing, Qantas moved to Terminal 3, so BA moved over all the Australian flights (including Bangkok and Singapore). As a result, many people here have come on a long trek across the airport. 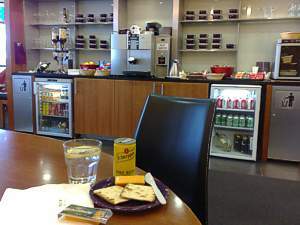 This lounge doubles up as the London Heathrow Qantas Club, however there is little Qantas branding other than a few Qantas magazines. If you're landing on a Qantas flight at Heathrow, remember too that First & Business class passengers arriving from Australia, Singapore or Bangkok are able make use of the American Airlines Arrivals Lounge with 29 showers, hot breakfasts and a pressing service. The First lounge is to the left of the main entrance hall, to the left of the Spa. There are normally two people manning the main entrance, in toll-booth type boxes. If you have a genuine First Class ticket (as opposed to getting entrance via oneworld Emerald), make sure you pick up a First Dining invitation here too: you won't be allowed into the restaurant without it. The BA London Heathrow Terminal 3 First Lounge is the same size and shape as the Business lounge next door, but a lot quieter: indeed, with the only flights with First Class leaving with one at 11am and then a rush at 9pm, normally this lounge is deserted during the day, with only the occasional oneworld Emerald popping in. However from 6pm, the rush builds, and by early evening it can be hard to find a decent seat, while by the Sparkling Wine bar there is almost a party atmosphere with ex-pat Aussies comparing their time in London, mixing with those off to holiday in Bangkok and Singapore. Without a Concorde Room in Terminal 3, the LHR T3 First Lounge can become quite an Australian celebrity haunt too: members of Cold Chisel mix with out of work Neighbours actors. The lounge is long and thin. As you enter, there are some very regal looking chairs by the door, then the Sparkling Wine bar is in front of you. To the left is the main Gold Bar room, with a big bar running the length of the room. 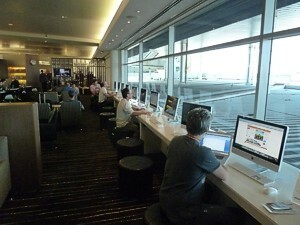 Computers are oddly right beside the bar on the left, while on the right are widely spaced chairs, and a view over the airport. This is by far the best area for lounging and people watching. Back from the entrance and turning right into the BA Terminal three lounge, there is a long coffee bar (serve yourself) opposite the children's room (With toys and well soundproofed door) which has a small sitting area outside it for parents. Further on and there is the secondary World Wine bar, and another view over the runway. On the right from here are high glass partitions and small enclosed private seating. Finally at the end is the buffet, and in the far corner, the First Dining Room. You have a choice of drinking areas with three very different bars in the lounge. The main one is of course the Sparkling Wine Bar, which oddly is a major disappointment. It looks superb in photos, but the atmosphere here is pretty stale. There are generally at least two types of Sparkling Wine available in the central bar trough, with one of them being a rosé and large sparkling Sparkling Wine glasses all under the crystal chandelier. Alas, seating is high bench style seats around the walls and large high formica tables, which looks like a 1960s cocktail bar. This is decidedly anti-conversational, and if you're with company it's hard to get a good gathering around the tables. It's a neat idea, but totally fails in the implementation because of the dry stale atmosphere. A much better drinking hole is the main gold bar, in the large airy room to the left. The long oval gold bar looks spectacular, and there is plenty of wine, with three good bottles of red and three of white, along the main bar. At the far end is the spirits bar, with Baileys and port. At the back of the bar is the spirits selection: it's the usual BA selection of 18 different bottles of free pour Cointreau, Tia Maria, Campari, Martin (x3), 5 whiskeys, six vodkas, and Gordon's gin. There are three types of brandy in the middle of the bar, behind the pile of crisps. Beer is in the fridge below, with four types including Guinness and London Pride. At the other end of the lounge is the World Wine Bar. Surrounded by racks of white and red in coolers, there are wine buckets with white, and red on the counter top. Alas, even though there are dozens of wines in the glass walled cabinet, there will only be four different types in the eight buckets in the counter. There is plenty of water here too - which is recommended if you want to remember your flight to Asia. 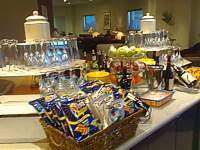 The food choices vary on when you travel, and how you got into the lounge. 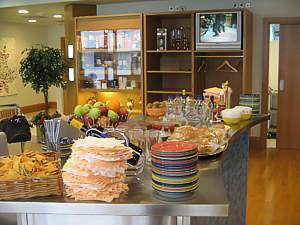 During the day, the only option is the buffet at the far end of the lounge, which at breakfast time has a full hot English breakfast, plus fruit and cereal on the counter behind. 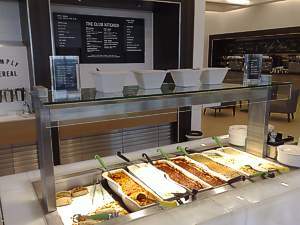 During the day the LHR BA T3 lounge comes down to salads with cheese and ham slices, with soup and one hot option on the main counter, but with the evening rush the number of hot options increases, while on the counter are fully plated meals, including lamb and chicken, plus hot meat pies for the Aussie contingent. 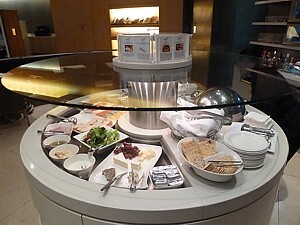 Also in the evening, a sandwich, cheese and salad trolley is wheeled out to next to the Sparkling Wine bar. This not only looks good – it's very convenient if you rush in here with only a few minutes to spare before your flight. The sandwiches run through various alternatives of cheese and ham, with a bit of salad on the side. The cheese is something else, with all sorts of good English varieties. The best dining option is saved for those with a real First class ticket: the First Dining Room. This operates with two different methods. Before 5pm, anyone can come in, and there is a decent enough menu with burgers and curries etc. Then from 5pm onwards you'll need a dining invite from reception to get in. The dining room has dining booths, or tables facing the windows for those on their own. The menu has three options for starters, mains, and deserts, and you will always be presented with a tray of canap&eactue;s pretty much as you sit down. The wine served here tends to be better than in the main bars too; the only issue is that it can sometime take an age to get mains: only sit here if you have at least a couple of hours before your flight. Computer facilities are good in the BA Heathrow First Class Terminal 3 lounge, thanks to the W+EZ (Work and Entertainment Zone) Area, beside the Gold Bar. There are about 20 computers here, with two printers and photo copiers, either up high on the shelf, or low down on the glass tables. They are new and fast. If you press down on the plastic circles in the tables, up pops a row of plugs with both UK/Hong Kong variants and US types (but oddly, no Australian plugs). There is also free wifi, which is blisteringly fast, except when everyone is in the lounge, when it slows to only just above dialup speed. In the British Airways Heathrow Terminal 3 First Class lounge Newspapers are in the plastic rack by the coffee bar, while newspapers are on the table immediately beside the Sparkling Wine bar. There are of course toilets in the lounge, while showers are outside in the spa, however if you have time, there are much better showers in the Cathay Pacific lounge, just down the corridor and past the SAS lounge. Alas the one thing the lounge doesn't do is anywhere for a nap: the only option here is the American Airlines Admirals club. There is therefore a regular trek for Frequent Flyers taking the evening flights after a hard day in the office in London of going off the to AA lounge for a nap, into Cathay for a sluice down & cocktails, then into the BA lounge for dinner, before heading to the Sparkling Wine bar for cocktails before the evening Qantas flight. It's such a well worn path, few of the staff even bother questioning it now. When it comes to exit the lounges, from the main entrance hall you can either take the main doors ahead, or the hidden exit is to leave the way you entered, but pressing the small hidden open door button to the right of the blue doors. NEWS: Euro-Traveller passengers are currently being offered the chance to upgrade to Club Europe for £59. This offer gives access to the Terraces Lounge, and should generally be taken at all costs. At LGW BA operate out of the North Terminal, which has a FastTrack security lane for passengers who have access to the lounges - however to use it, you must get a FastTrack sticker, which is not offered if you check in Online or at the Machines. Once through security, the lounge complex is on the extreme left of the Terminal as you walk in, past the shopping area, and along past the spiral in the ground that looks like a jet engine. Go past the double doors, and down the dingy corridor on the right. Signs show that the lounge is accessed via the lift, but this is very slow - if you are fit take the unmarked CIP (Commercially Important Passenger) stairs next to it. In the lift it's clear to see the major changes in the lounge: it used to occupy a vast area on the ground floor, but as BA has steadily pulled out of Gatwick, so the lounge has shrunk to the top floor. Appropriately, the old BA lounge is now occupied by Emirates. 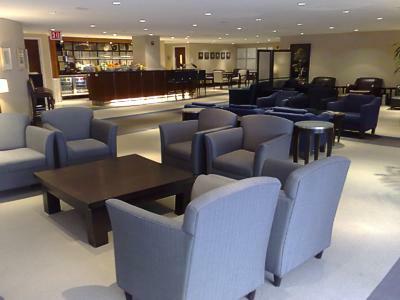 Once on the first floor, the Terraces (Club) lounge is on your left, and the First lounge is on your right. Note that if you have a flight from a gate number 100 and above, it is a long walk over the bridge to your gate - however there is no return to the lounge. At Gatwick BA have the system to show flights as "boarding" at half an hour to their scheduled departure time, rather than when they actually are boarding, therefore chances are you'll either have a mad run, or a long time to hang around at the gate. As you enter the lounge there is a long L shaped reception desk: this desk was originally on the ground floor, and doubles up as the service desk, however as the number of BA destinations from Gatwick decreases year on year, the staff here (whisper it quietly) don't seem to have a lot to do: as such, they are very friendly. The lounge itself is also L shaped. Most people grab a seat close to the reception desk, where there are large squishy brown leather armchairs, and a pleasant cluby atmosphere, although on Friday nights this area can be rammed. If you walk around you'll find much more space - and also an excellent view of the airport, from opposite the food and drinks bars. There used to be a twinkling fountain here, with tweety birds and everything, but that bit the dust along with most of the Terraces fountains in 2007 (only the JFK one still remains in its original state). Instead, there are just a couple of the original wavy bars, and the food cooler fridge. Further round in the corner is one of the nicest spots in the airport, with two chairs giving an excellent view of the gates, runway, and the famous Gatwick terminal bridge: one of the only places in the world where you can walk over the top of the planes. Carry on left and there is the spirits bar, the newspaper rack, some more quiet seating (with power points between the seats), and at the far end the computer centre. The main bar is on the corner. It has one of BA's few remaining World Wine Bars, however it is slightly smaller than the one at LHR with only 6 white and 6 red wines. There are also two types of port in the trough, and the Baileys. Behind the bar is a mind boggling array of spirits. In the fridges under the counter are cans of Heineken, Grolsh and London Pride, plus plenty of soft drinks and bottles of water. 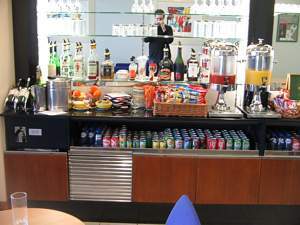 The other bar - the wavy blue one - has canisters of tomato and orange juice, while behind it is the cappuccino machine, which does a mean cup of coffee. Food is more basic than you'll get at London Heathrow. Next to the world Wine Bar is a Welsh dresser which has three trays of sandwiches during the day (meat, fish, and vegetarian): at breakfast time there are lots of fruit, yoghurt, and cereal in here until 1100. Later in the day there are biscuits, packets of Walker's Fruit Cake, nuts, olives, and two types of cheese (cheddar and Leicester) with three types of cheese crackers. Meanwhile in the new fridge - where the fountain was - in the middle of the room, there is an OK salad setup, with cheese, beef and ham, plus lettuce, tomato, potato and pasta. Soup is in the touraine at the end of the counter. Dotted around the lounge are stands with newspapers - there is normally a selection of each of the main UK papers - but only a few of each, and international papers - which you can take onto your flight. Close to the entrance there is a thin hall table with magazines, mostly travel related including racks of Business Traveller magazines, giving the impression that they can't give them away, along with New Statesman and Prospect. At the far end of the lounge there is a very small business centre with seven computers that have seen better days: some are decent, while others are on their last legs: they print to the fax machine behind the pillar (although this machine doesn't always work). Getting access to a computer is often a struggle, particularly when BA staff spend all day on them. In the corridor between the first and business class sections there is a corridor which contains the joint First and Business Class shower suite of three showers. A decade ago they were well kept and clean, but they are showing their age now, and this is not a true Moulton Brown spa. When you leave the shower, make sure you turn left back into the business lounge: right is First Class, although there are no ticket checks on this door. This is a lovely quiet room away from the hubub that may be families departing on holiday with a bucket and spade in the Terraces next door. To in here you are an elite - if only because, LGW now has so few four-class planes with a First Class section, virtually the entire room is made up of Gold card holders - and that means you can sometimes be the only one in here. 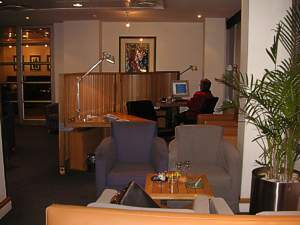 Even the person guarding the lounge - on the desk as you go in - is very relaxed, and often glad of the company. Facilities in this room are poorer than at LHR. There is no bar for example, and you have to pour drinks yourself. The drinks counter is on the righthand side of the bar bod. There will usually be a couple of bottles of Sparkling Wine, and a couple of red and whites, plus the usual beer in the fridge. Johnny Walker Blue Label makes an appearance in the well stocked spirits section. Food is also noticeably poorer than in LHR, with just a selection of sandwiches and dips in the fridge. You can however ask the staff to serve you that staple of First Class travellers - a bacon butty. It goes well with a glass of Sparkling Wine in the morning. Behind the reception desk are a couple of computers, however there is often a queue. If you really need to use a computer you may be better taking the short cut of walking through past the spa and the door to the toilets to the Terraces lounge - a route that bypasses the ticket & card checks. This is quite a small lounge, and always seems to be incredibly busy with flights leaving to Gatwick and Heathrow on a regular basis. Chairs are hard to come by at these times - there are the usual different types, with a nice comfy sofa around the back wall. There is no view of the runway. There is now a new 'overflow' area, which also give some more open space - this is through the door to the left of the main reception desk - here there is a kind of patio area, surrounded by frosted glass, but in the main concourse. 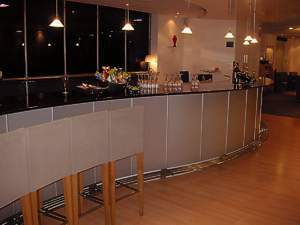 The Bar is very good, with the standard curved Terraces lounge type. The fridges have the usual beer selection, with Stella, Grolsh, and Newcastle. Plus, unusually, Irn Bru. Food is quite unusual, with plenty of Mango Chilli Kettle Chips and Walkers Shortbread throughout the day, and occasionally there is a cart containing sandwiches (including prawn and mayonnaise, plus smoked salmon). On it's arrival the lounge decends into chaos, and all the businessmen arrive and attack the cart! There are two computers in what passes for a business centre, which also has a fax & printer. It's actually just a desk to the right of the main seating area, and not very private at all. 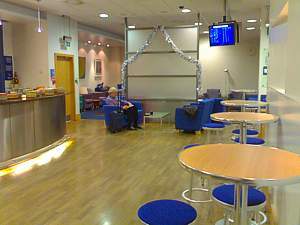 There are actually two lounges down the same pier at Glasgow: which all seems rather pointless, until you find out how small the main lounge is. It just takes a delay on the Gatwick & Heathrow flights for there to be a logjam, and not a single spare seat can be found. The Bar is a non-standard straight bar, with some more unusual whiskys. The fridges have only the usual beer selection, with Stella, Grolsh, and Newcastle Brown Ale. There is a coffee machine on the bar top which does a mean latte. Food is laid out on a small table to the right of the bar, and hsa lots of Kettle Chips and Walkers Shortbread throughout the day. Sandwiches appear at lunchtimes & the evening, and include some very cood ham & cheese ones, plus some chopped egg. The ComBiz business centre is really funny - it is all of one computer stuffed into a tiny cupboard, right opposite the main desk, which means everyone at that desk can see what you are typing. 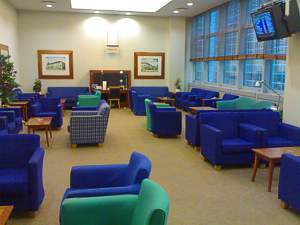 This is the overflow lounge, which is only really ever used on weekday mornings - and even then it is sometimes closed if there are light loads on the London flights. 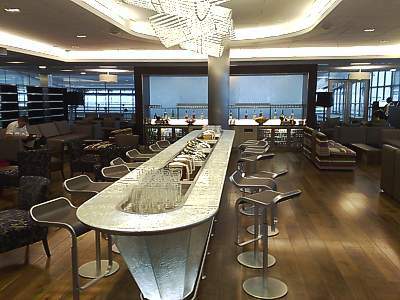 The vast mother of a lounge in Manchester was actually the showpiece test lounge, when BA revamped the lounge concept back in 1998, and it still shows it's style - and size - today. It gives the impression of the airport being designed around it, which in all fairness it probably was. After you walk up the stairs from the main waiting hall beloew, the main feature strikes you - the huge circular central rotundra, around which the lounge is based. You can see all the way down into where the great unwashed wait for their flights, around the O8 bar. To kind of rub the point in, some of the bar stools are arranged looking into the main circular waitting hall. There is also a long straight wall, which overlooks the runway, and it is along this wall that there are racks of sunlounges. Further along there are some rather uncomfortable leather sofas. Further around is the Combiz business centre, with plenty of desks, but only two rather ancient computers and a printer, and a meeting room table, which is part of the main lounge, and not very private, with a coffee machine near it. Going back to the main lounge the main World Wine Bar overlooks the circle, and is the usual Terraces curvey type with 4 whites, 4 reds, all the usual beers, and a special treat: Boddingtons - the Cream of Manchester. There is another bar over on the other side of the circle, but this is less well stocked. It is however near where the small portable TV is, which doubles up as the children's play area. Food is equally good, with the usual slices of shortbread, plus breakfast (to 1130) and sandwiches (12-2, and 5-7pm) but these are very plain ham or cheese. There are chunks of cheddar in the fridge at all times. 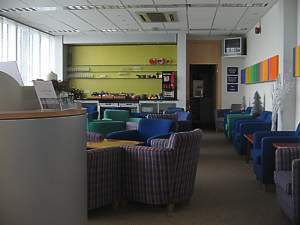 There are several newspaper racks in the lounge, with a full selection of all the UK dailies, however despite the appearance of a library, there are no magazines. 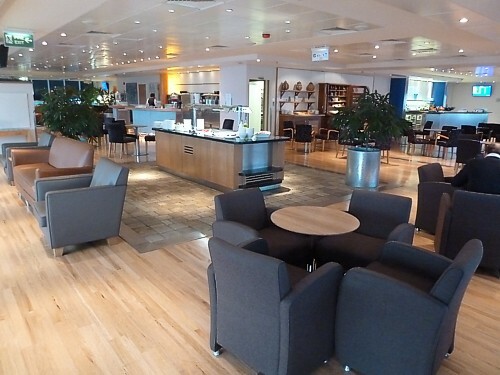 Access to this lounge is given to Silver & Golds, plus those on a fully flexible ticket. If transfering flights, make sure you go upstairs when you disembark, and don't exit the terminal - otherwise you'll have to get back in again. Oddly, to do this, you end up having your photo taken if you are on UK to UK transfers. 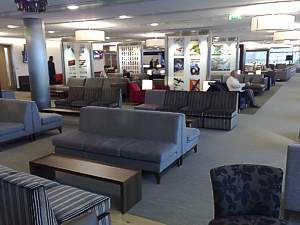 The British Airways lounge in Jersey is something of an enigma: it's tiny, and on the end of a very short route, and yet with four flights a day packed in Club Europe: the financial industry in the Channel Islands is the mainstay of this route for BA, and hence for this lounge. It can get very busy with flight back to the square mile, and perhaps because of this, the spirit selection is remarkable. It's after security, and sometime security are sniffy about letting you through until your flight has been called, unless you have a lounge invite, although these are rarely handed out nowadays. It is then a wiggle through the corridors at this small airport. There is a small reception desk in the lounge, which in reality is all of one room, separated by a flimsy divider, for the bar. 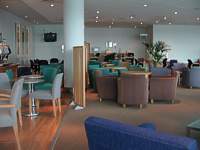 The lounge however is a full terraces, with all the usual terrace furniture, from the blue armchairs to the slightly too high glass top tables. Around the bar area there are also three high bar tables. There isn't a view out to the runway as such, but there is a very useful second door through which you can exit, and walk straight over the tarmac to your plane: being such a small lounge boarding calls are made in person, and you are herded out towards your plane. 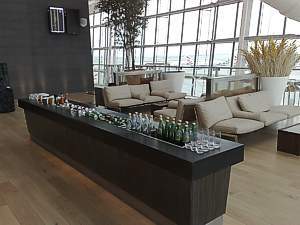 And it is the bar that many people use this lounge for: after all, on the flight to Jersey you'll be in the air for about 30 minutes, but sometimes spend 3 hours on the ground, so it's well worth while getting a drink. And drink you can: the bar has the most amazing rack of 22 types of spirits, from Glayva to Canadian Club. Wine is equally good, with plenty of Oyster Bay and the line. White is in the bucket s on the counter top. There are alas no computers or showers in the lounge. Curiously the BA Terrace Lounge at Jersey is also now a PriorityPass lounge: unusual for a BA lounge. The route to this vast lounge (which is run by BA, but also sold onto Emirates and Swiss passengers) is via a small staircase to the right after the first set of security (there is a second set of metal detectors before the gates that BA uses, which are only occasionally used), at the top of which there is wide entrance desk with the unusually tame lounge dragons. The actual lounge itself is huge - seemingly far larger than BA would ever need at this outpost, although the occasional conferences and Expos do generate a lot of premium travel that do just about fill up the lounge, particularly when the Manchester and Birmingham flights leave at the same times at the LHR ones. To the left as you go in is the probably the nicest place to sit - on the sunloungers looking through windows over the central gate area. Ahead of this is the Winebar which has recently been reduce. Now there are only the usual BA stocks of 4 types of white, and 4 of red. There are now only 10 types of spirits behind the bar aren't bad either, although the Baileys is not chilled (unlike at LHR) but there is Bacardi, Sandemanm Martini, Campari, Smirnoff, Ballentines whisky, Remy Martini VSOP, and Beefeater Gin. There is are only two types of beer. Not even Alt Beer either, it is a rather tame German Pils, and Bitberger, in small glass bottles. Further round there is the usual Terraces Fountain around a garden court - which has recently been filled in as a garden. There is a small Food Counter. The lounge now has some food in the mornings. True, it's just a tray of sandwiches (German Sausage on white bread) sitting on a tray by the world wine bar, but it's a better offering than there was. There are also strange long strips of Edam cheese, on a stick, in plastic wrapping. 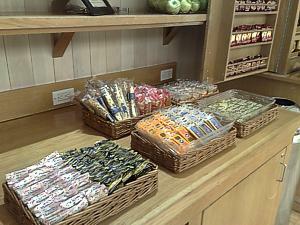 There are also cold snacks including apples, biscuits, nuts, crisps, cakes. There is no warm food. On the wine bar are two bowls of olives - one black, the other red. Round at the back next to the smoking area is another bar, with a much better coffee machine, and a stack of different types of tea bags, but no alcohol. At the back there is a quiet area, next to the book cases, and several desks with banks of telephones, but no computers or internet access. Newspapers are on two racks, with just the Guardian, Express and Mail from the UK (and in the mornings, just yesterdays papers) but with plenty of German papers, and a couple of German magazines, like Stern. All in all, it is a pretty good and relaxing lounge, but one that can make you feel pretty lonely sitting there on your own. In the smart new Hamburg airport, BA's lounge is on the upper walkway - which you won't find unless you know where to look. As you pass through security look for the small door on the right hand side. There is a small sign above it marked "lounges". Go through the door and up the small rather squalid stairs, or take the very slow lift. BA's lounge is near the Lufthansa one, at the far end of the long corridor, past the generic airport lounge and through the big glass door on the right. Getting in is the major problem at this lounge - even a full fare Club Europe ticket won't get you in. Instead you need status with the Executive Club - either Silver or Gold. Partly due to this, the generic airport lounge does a roaring trade in selling entry (at €17 a go). The reason for this selectiveness is that the lounge is very small - it can really only take about 20 people. Still, it does an OK job, and has a huge picture window with a view of the airport apron. There is even an outdoor observation terrace, which alas has been shut for security reasons (although the Lufthansa one next door is still open). Food is just the usual biscuits and nuts, while the bar is somewhat more impressive, with plenty of wine and spirits. There are no loos or showers in the lounge - instead there are communal ones in the corridor outside. terminal. The terminal itself is a 1960s concrete classic, in a large circle - with checkin desk beside each gate for the aircraft. Make sure you go to the lounge before security, and only head to the gate as your aircraft is called: after security there are no facilites. Thankfully the lounge dragons call each flight just as they are boarding, rather than their scheduled time. To get to this lounge, head up the concrete spiral stairs above the coffee stall - which is some way from the ticket office, checkin and gate that BA use, on the opposite side of the circle. The lounge itself is pretty small - smaler even than the now closed lounge in Cologne - and so it can get pretty crowded with B list Berlin celebrities and politicians. However it boasts all the facilities you'd expect in a Terraces, with a fountain and sunloungers, a couple of big stiff backed armchairs, and a large curved world wine bar. It also has a great view over the low-cost terminal and the apron. Above the bar is a small TV, with just domestic German channels. Once past the desk is the World Winebar with the standard BA stocks of 4 types of white, and 4 of red. On the worktop is an icebucket with Sparkling Wine - alas of Lufthansa origin. The 16 types of spirits behind the bar aren't bad either, although the Baileys is not chilled (unlike at LHR) and there is a full selection of beer, with the 4 standard BA types in cans, and bottles of Erdinger (both the Wheat and the Clear types). There are even logoed glasses. A coffee machine, and a stack of different types of tea bags completes the choices. Food has recently been downgraded. Now there are only nuts, cheese twizzles, and small cakes in a plastic wrapping. In the fridge there are strange long strips of Edam cheese, on a stick, in plastic wrapping, and there are some biscuits next to it. Opposite the bar is the usual Terraces Fountain around a garden court - with very loud tweety birds. At the back there is a quiet area, overlooking the car park, and further back there is a smoking room and a special VIP room, which is normally closed. Overlooking the low cost terminal there are several desks, but no computers or internet. One bad point is that there are no toilets or showers in the lounge - you have to go all the way downstairs, then into the basement, via the concrete stairwell. If you do this, don't leave your luggage in the lounge - thefts have been increasing. Newspapers are on a table by the fountain, with a full selection of most of the UK's papers including the Guardian, Times, Express and Mail from the UK (and in the mornings, just yesterdays papers). There also a few German papers. as far as the Rijksmuseum Amsterdam Schiphol (On the Holland Boulevard, in the area beyond passport control between the E and F Pier). 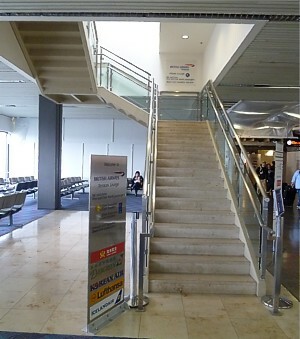 Go up the stairs here, passing the two generic lounges, and past the KLM lounge. Up the corridor at the far end is the door to what Amsterdam calls "Lounge 40" - the Terraces. So why make the long journey? In a word - the Food. This lounge is notorious for one attraction. Cup-a-soup. There is a soup dispenser, with plenty of variety, and the soup is actually really good. Also there are sandwiches on silver platter - the salmon ones are really good (but get them when they come out, otherwise they curl up at the edges). There are bowls of chocolate biscuits, and even some special biscuits to have with your coffee. Cheese makes an appearance, with lots of Gouda and Edam, plus the obligatory biscuits for it to go on. Bags of crips are in a basket on the worktop. There are even a couple of different types of olives, and lots of fruit. All in all, it makes a nice change from the usual BA offerings. The lounge itself is split into 3 sections. Behind the entrance desk is the smoking area. 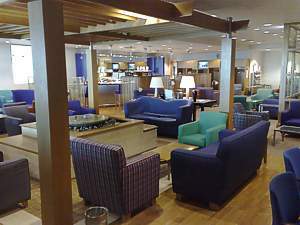 The main body of the lounge is in the centre, with a long bar, while at the far end is a quiet room, that also has the usual 4 sunloungers, and a large desk. The view from here is a the best, with a small part of the runway visable, however even here the view is obscured by parts of the building. There are no computers or toilets in the lounge. The bar in the main room is not the usual Terraces type, and there are just 2 types of red on the counter, and 2 whites in ice buckets (which rarely get changed, so the white is often quite warm). There are 9 spirits in large free-pour bottles on the shelf (Bacardi, Beefeater gin, Campari, Baileys, VSOP, Smirnoff vodka, and 3 types of whisky). There are two large glass jars, one with tomato, and the other with orange juice, while under the counter is a rack with plenty of cans of mixers (and coke in larger cans). Ice and lemon are in buckets on the top. This lounge has the delight of the usual Netherlands "tamping" stick, with a flat end which you can use to squeeze your lemon while it's in the G&T - a lovely invention I've only ever seen in Amsterdam. There is only one beer available here - Heiniken. There is another bar in the quiet area, with a smaller selection. Newspapers are on a rack by the door, with all of the UK papers, and one copy of the dutch ones. There are a few magazines, however these are mostly American. 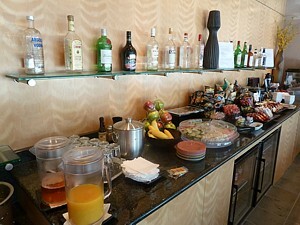 The JAL lounge around the corner offers some extra delights if you fancy going on a lounge crawl. 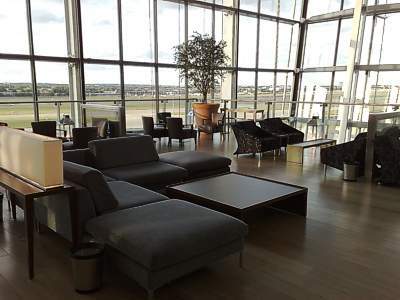 The newly refurbished Terraces lounge at Brussels airport is designed as a showcase for BA's new lounge concept. And it's gorgeous. Swish, clean, modern, and large enough so it never gets crowded, with great views of the gates where your plane is parked. It may seem surprising that there is even any requirement for a lounge on such a short route (indeed, you're likely to spend longer in here that on the aircraft) but BA pack in customers on flights 5 times a day - and most of them are in the expensive seats. The redesign adds stunning features including the Blue bar with a glittering chandelier, on the left after you go in. There are a couple of bottles of red and white wine on the counter top. Further around the spirits are lined up above fridges which hold a great array of beer. There are bottles of Guinness, Bass, Leffe Blonde, hoegaarden, and Bellevue Kriek cherry beer. Plus, sadly, cans of Stella. There are two nut machines here - twist the knob, and a handful of nuts come out of one, while you get strange nibbly bits out of the other. Further around - past the fabulous furnishings, and the artwork collection (look at that leafy murral on the wall - it is actually art) - there is a Coffee machine, and what is described as a Food Hall. 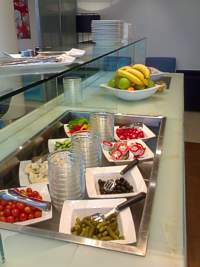 In the morning there is quite a decent breakfast, but by lunchtime it turns into a salad bar with lots of cauliflower, cuecumber, tomatoes, gerkins, olives, several different types of dips. Above the dining tables is a plasma TV screens - which is often on the BBC. At the end of the room there is a well-equipped Business Centre with fast, modern, PCs with internet access, a photocopier and a fax. 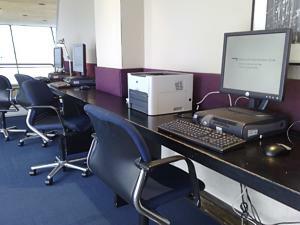 There are two more computers at the other end of the room (under the architectural models of Brussels airport), and throughout there is Wifi broadband access. Congratulations if you find this lounge. It is a seroiusly agrivating struggle, due to the lack of any signs in the airport announcing its location, but it is ultimately worth it. After checkin - in the new basement pavilion of Terminal 2 - go through security (don't use the Business Fasttrack - where everyone is searched manually. This is very slow) turn right and go to the far end of the D concourse. Turn left at the JAL lounge, and head to the lift hidden behind the pillar where there is the first sign annoucing that it goes down to the BA lounge. 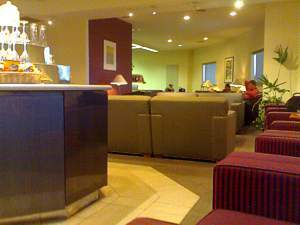 The lounge is split into two, with the divider at the small entrance desk. Both sides are absolutely idential, although that on the right is a little bigger. They both have a small dining room section oposite the bar & servery, then three banks of the usual Terraces blue squasy armchairs. It's pretty big, so apart from in the afternoon (when 3 flights leave for LHR between half 2 and 3.30) it never seems very crowded. The view on one side is of the staff car park security gates, but then on the other its just of a light well. Take your pick of dull. This might be why there is almost permanent piped music in the lounge, generally of stering waltzes and German Umpah bands. It is many things, but relaxing it is not. The bar is good for wine, with two decent whites in wine coolers - and Sparkling Resilng (one of the few BA lounges to still have any sparkling wine) plus two reds on the counter top. There is however only Becks beer, and even soft drinks seem to be either Fanta, Coke, Tonic, or Ginger ale in mini cans. There is however apple & tomato juice in jugs. Spirits are very poor, with just an unchilled Baileys, Campari, Ballentines Whisky, Gordon's Gin, and an unknown Russian vodka. Food wise there are slices of fruit cake, a plate of biscuits, and the usual German lounge strips of cheese on a stick. There is also a plate of what looks like bird seed. There are all the usual UK national Newspapers, plus a fair few of the German ones, and a good selection of all the Traveller type magazines. There are no computers, however there is wifi from T-Mobile - but at €6 for 3 hours. Around the back is a corridor with pretty palacial loos that links the two sides, however the other corridor with display booths is normally locked up, and used to store the junk of BA employees. The Cathay Pacific lounge at the other end of the terminal (used by Qantas) has computers so it may be worth the long hike up here (past the Malaysian and Emirates lounges). At the remote outpost in Athens it's a delight to find that there is a small but full equipted Terraces. Compared the smoggy overpriced hell that can be the city, its lovely and welcoming. Unusually it's after passport control, and before security. Head all the way down the shopping arcade, and it's after the vast Olympic lounge, and before the Swissport lounge. Past the reception desk - which is the only way of finding out about flight departures (there are no screens in the lounge) there are large windows - alas, overlooking an office block, not the runway - a bar on the left, comfy seats around a fountain on the right, some sunloungers, computers on the far right, and a small smoking room. There are no toilet or shower facilities. The Bar is pretty good, with a full selection of Spirits including Gordon's Gin, Regal, Baileys, Grand Marnier, JW Red, Smirnoff, and two types of Oozo. Cans of Amstel & Heiniken are in the fridge. Alas, there is only one type of red & White wine (bad Greek ones) in the round holes in the bar top. There are jugs of Orange & Tomato Juice, and a coffee machine. Newspapers are in the rack to the left of the bar, and there is a full selection of Greek papers, but only the Daily Mail from the UK. To the left of the bar is a Television, normally left on BBC World. It is alas high up in a cabinet in the wall, and as such watching it can be a right pain - only the high seats at the bar give a decent view. Anywhere else and you'll get a permanent crink in your kneck. Food isn't great in the British Airways Lounge Athens, but is at least there. A couple of hours before each flight a tray of rolls is put out, with ham, cheese (Brie), salami, and, very oddly, pesto & tomato options. The Combiz business center is really just a couple of desks at the far end of the room, There are two computers which are pretty slow (press Enter to get past the password login screens) a fax & photocopier. 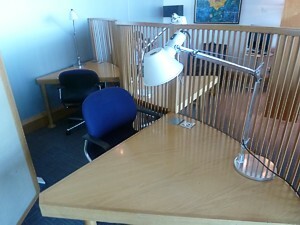 There are also four desks where you can plug in a laptop. 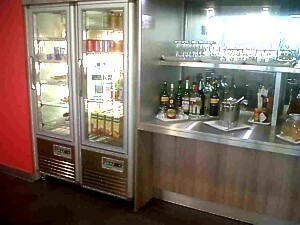 In the lounge there is a glass cabinet with lots of duty free items for sale. There is everything from Oozo to little models of the Pathenon, and even JW Blue. 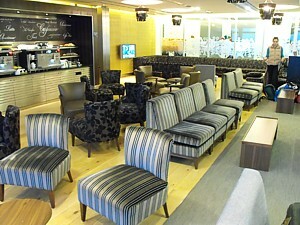 The British Airways lounge Istanbul is a standard old style Terraces, however it is wearing well. 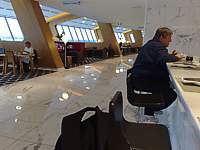 Indeed it would be a haven at this outpost, if it wasn't for the fact that Istanbul is the unlikely king of the airport lounge, with dozens to choose from, thanks to all the major banks having their own lounges of varying quality at the airport. Once through security, turn right, go under the HSBC Premier lounge, ignore the Istanbul Millenium lounge and all the other lounge on the top floor, take the escalator down by the food court, turn right again by the other two lounges, and it is on the bottom floor. 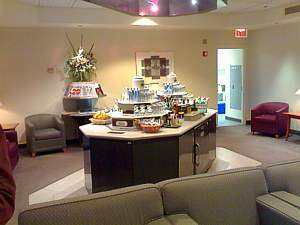 There is a small reception desk, and the lounge occupies all of the large rectangular room. The bar is pretty decent, with a good range of spirits, and one bottle of white wine and another of red. Cans of soft drink are in the fridge under the counter, as are bottles of beer. Food is a bit Spartan, although an hour or so before each flight departs, a tray of sandwiches comes out. The work area is a joke. 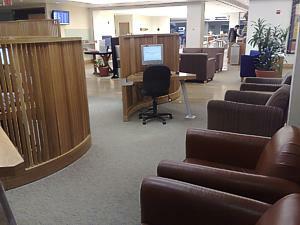 There are two very slow computers, on rickety desks, separated from the main lounge area with a wooden screen. Thankfully there is free wifi. Newspapers are good though. There is a decent newspaper rack, with plenty of copies of the FT, and one copy of each of the main UK papers, however these are only updated with the current days papers when the first flight from Heathrow arrives. There are no showers in the BA Business Class lounge in Istanbul, and even the toilets are outside the lounge, around the corner of the corridor. 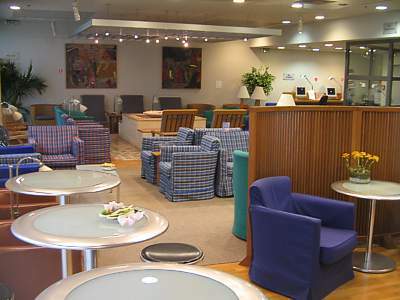 Note that although the lounge is technically open all day, because the flight times from Istanbul are well staggered throughout the day, if there are no people using the lounge for other flights, the lounge staff tend to turn the lights off and lock the door from 9am until midday, and then from 2pm until 3.30pm. Since the end of open doors for Golds, this has now become common practice. 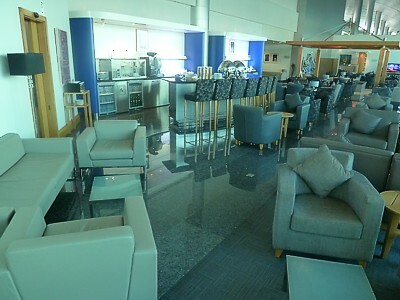 At Dubai, British Airways has a lounge half way down the long airport terminal. You may be grateful for it after the long walk here: after the tired and miserable checkin counters, which look as if they were directly transplanted from the old LHR T2, there is a grim passport check, a long walk down a tunnel, which goes under the taxiways, and back up to the satellite terminal itself. This is a wonder to behold if you love your bling: fake golden palm trees and all. The BA lounge is a good ten minute walk down what appears to be a giant shopping centre, right beside the Lufthansa lounge. Alas with the end of open doors for LH Senators and BA Golds, there are no longer the lounge hopping opportunities there once were. Indeed once you are past the small desk, the British Airways Lounge at Dubai is a bit of a disappointment. 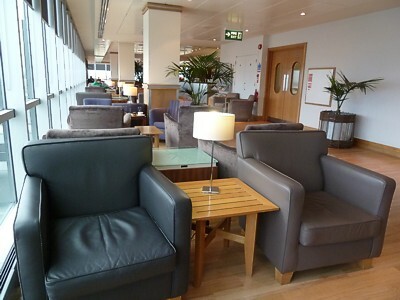 The lounge itself is just a good old fashioned BA Terraces Lounge. Dubai doesn't have a First side: everyone is in together (despite the considerable premium traffic at the airport). However it is a good chance to see what an old Terraces is like, before they all disappear: the only sign of modernity is that some of the chairs have been replaced with the new-fabric versions. 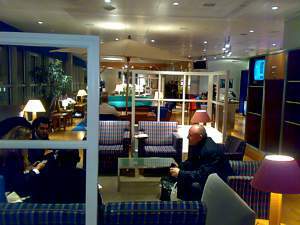 There are large floor to ceiling windows running the length of the lounge, however they are some way from the lounge itself, due to the tube like nature of the terminal. In effect you stare out a long way through grimy glass to see the planes, past pot-plants. Right in the middle of the lounge at the entrance is a twinkling fountain – it's a rarity in that it is one of the few original Terraces fountains on the network that still works! It's under a fake pagoda. Then on the left is an area with sofas, and a TV, plus the small workstation area. In the other half of the lounge is a rack of large armchairs, and the curvy bar. It is the bar that is highlight of many ex-pat's visit here, considering Dubai seems to float on the stuff. At least this is done well. There are a few bar stools, but you feel pretty obvious perched up on these, with your back to the window. There is a good wine selection, with a cheap French Sparkling Wine, two whites, and two very good reds in the wine rack on the bar top. Of course some much nicer reds are placed in the wine rack next to it to tempt you. Beer is the usual BA varieties of Fosters, Amstel, Carlsberg, and Budweiser in the fridge. Food is a bit of a letdown in the Dubai BA lounge. Forget the decent salad bar of LHR: there isn't even pre-flight dining for First. Instead, there is a small fridge cabinet with a few sandwiches in it, and for the late evening flights, two hot tourines with rice and curry, plus local snacks (shwarras) and soup. For the morning flight hot breakfast is also put out here, with scrambled egg, chicken sausages, and bacon. There are also four jars of cereal. Business facilities are woeful. There are no computers at all: just three small triangular workstations. And that's it. There is a television (normally on BBC World) at the end of the sofas. At least the magazine selection is impressive (naturally, with plenty of luxury lifestyle magazines), and with plenty of papers two, with the Mail and Times from the UK, plus the Wall Street Journal. There are toilets in the lounge, but these haven't been updated since it was built, and there are no showers. There is a small left luggage rack by reception, and one other small highlight: opposite the fountain, there is a small display of BA aircraft that have flown to Dubai over the decades. Compared to the dourness of Malpensa (the airport is rather like a grim shopping centre in the middle of fields) and the horrors of checkin (the BA checkin is in a drafty hall, past some grim extra security checks) the lounge is a delight. Head all the way down the B concourse after the non-schengen passport checks, then up the escalator. 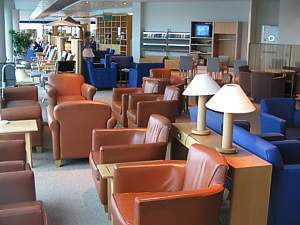 The lounge can suffer from overcrowding, as it is used by JAL, Singapore, Qatar, Delta, Emirates, and even FlyBE. When this lot is departing in the morning, space is at a premium, and yet the lounge is half the size it was. The nice part - which overlooked the runway - has been removed, and now there is just a blank wall at the entrance to the washrooms where you used to walk through. Now the only windows overlook the grim checkin area. Still, the lounge is still pretty big, with plenty of sofas, the usual terraces fountain at the far end, and plenty of reading lights. Alas every one of these lights has had their bulbs removed as an economy measure. There is one long curvy bar. In the trough is the sparkling Pinot, plus a rather grim white. Next to it on the worktop is the red, normally a Chianti. In the fridge there are cans of Tuborg, Spugen, and bottles of Becks. 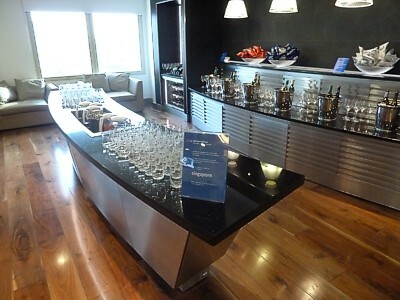 At one end of the bar - with shot glasses - are bottles of Ballantines, Red Label, Averna, and Molinari. Chilled vodka, Martini and gin are in the trough. Food is a bit variable. On the worktop there is a heated cabinet with pizza slices and mini bruchetta (which really suffer at the end of the day) while on the curvy bar there are three trays of sandwiches and crossants, plus tubs of olives, curkins, and crips. There are two newspaper racks (one bar the door, the other in the far corner of the lounge) with most of the UK's broadsheets, and some of the Italian press. Past the fountain there are four work desks, but no computers. Wifi is BT Openzone. 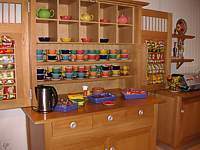 This is a pretty small room which gets very busy during the winter season, and is decorated in the old Terraces style. 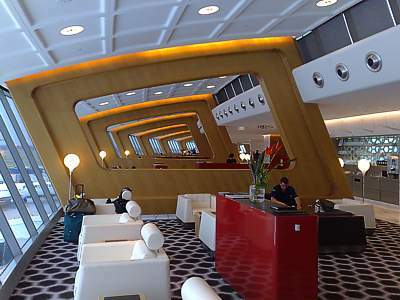 You enter after passport control, and pass the small smoking room on the left hand side, and the reception desk. There is the usual parasol, a fountain, and a decent view through full height windows. Food as you'd expect is pretty basic, with just crisps and olives. 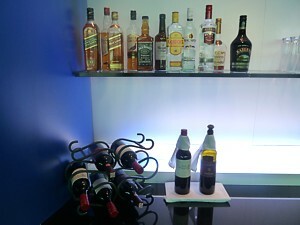 There is a good bar at the far end of the lounge, with a couple of white and red wines, plus the usual beers. Sparkling Wine is stocked, but not advertised. You have to ask the bar staff specifically for this, and they will bring you a glass (but not the bottle). There are no showers or toilets: instead you have to use the facilities outside, accross the hall, which are pretty hidden. There is wireless Internet access plus 3 fast, new, internet connected computers. At New York, British Airways have a half share in their own terminal (the other half belonging to United), which makes for a much quieter experience on the ground. Checkin has two ranks of desks for the riffraff, and on the left is a separate area for business. Behind this is the area for First and Golds, who have their own security checkpoint that leads to the Concorde Room. Everyone else has to go through the main security, then if you double back up the small escalator (which also leads to the United lounge) there is a reception desk for the BA lounge at the top. First (Golds, and one world Emerald) is on the left, Business (and Silvers) are on the right. This takes the form of a long thin room, with a bar on the right as you go in, a kind of light central area, with windows overlooking a flat roof, and then at the back a thin corridor with computers and a small window overlooking the check in area. There are plenty of chairs, however only those up against the near wall are the big squashy arm chairs with footstalls. The other ones nearer the centre of the lounge are lighter, if a trifle harder. Oddly, there are some more formal dining chairs by the door, however since the food is generally pretty poor in the lounge, these get little use, other than for those who put their laptops on them. The bar may be small, but it is a noticeable step up from the business side, in that it has Sparkling Wine, typically of the Piper Heidsieck variety. There are also three types of white in the trough, and three reds on the worktop. There is the same beer as in business under the counter though, and no other spirits. Food is slightly better in First, with trays of sandwiches that are actually pretty good. Other than that, it's a question of bags of crisps, olives, and cheese and biscuits. There are also some apples, closely wrapped in cling film, in the American style. Notices give stern warnings about the penalties if you take these onto a flight. For serious pre-flight dining you have to nip over to the business side. Newspapers are on a rack by the bar, and are refreshed as soon as the first flight of the day from the UK gets in. There are plenty of Telegraphs, Mails, and Times. There are also all the usual New York papers. Computers are by the window at the far end of the lounge. There are all of three, plus a printer. They are neither particularly fast nor impressive, but have an OK net connection. At busy times though there may be a queue to get on one. The business lounge is an old fashioned Terraces. It was cutting edge back in 2001, but is getting decidedly worn around the edges by now. A revamp is planned, to bring it up to the standard of the galleries. 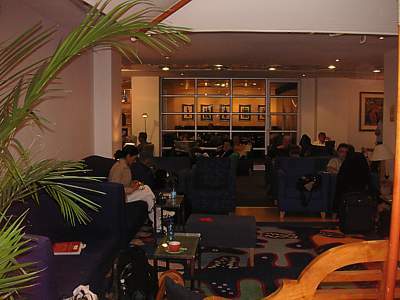 There is a strange sort of pre-lounge lounge on the right as you enter, which is kept dark and supposed to be a kind of quiet area, however as everyone walks past it and its wide open, it is neither quiet nor private and acts really like a kind of overspill section. The main lounge as you enter has the food ahead of you, computers on the right, then as you carry on down this arm there is a kind of library and quiet area, with the spa at the far end. Going back to the bridge of the U, there is the usual tinkling fountain ahead of you, the a bar on the left, the Club World dining room straight ahead, and then on the right another bar and racks of seating. The windows here overlook checkin, and then right at the far end is a small window - the only natural light in the lounge. 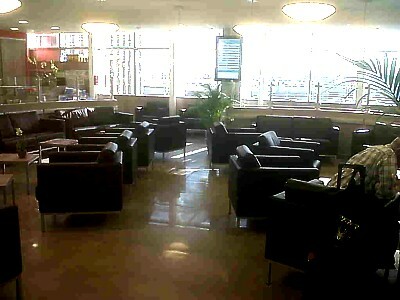 However the lounge still manages to be bright and airy, even if it is such a busy place it isn't all that relaxing. 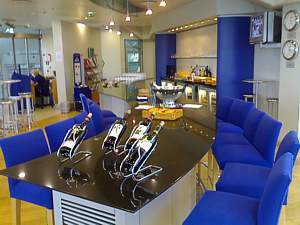 The two Bar areas are pretty much the same, with bottles of beer, including Bud, Coors Light, Bass, Heineken and Stella below the worktop. There are jugs of juice on top, and a couple of white and red wines. Spirits has the usual BA range of Jonny Walker Black label, Southern Comfort, Camparis, Glenlivet, Jamesons, Martini, Bacardi, Gery Goose Vodka, Brambuie, Tia Maria, Baileys and contreau. Food really isn't brilliant. In the mornings there are croissants and cereal, and then in the lull before the rush of evening flights these are replaced by crisps and nuts, slabs of cheese in plastic packets, and breadsticks. There are also packets of soup. For better dining before your flight, which means you can maximise sleep on board, head to the Club World pre-flight dining room. Here there is a full sit down meal, or grab something such as a very good salad from the buffet. Alas, it is not available if you get in with an Executive Club card, as opposed to a Club World ticket. 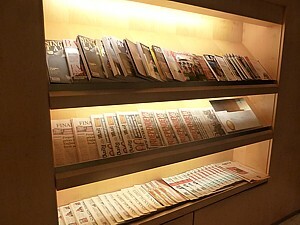 Newspapers are on a rack by the door, along with magazines such as Wallpaper and Business Traveller. There is usual more quantity - and quality - here than on the First side. Computers can be hard to come by. There are just half a dozen, often with a queue to get on one, set around the rather nice wood panelled screens. Behind this is the library area, and then further on is the Spa. Here you can get 15 minute treatments and massages, along with a shower. 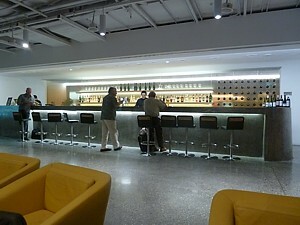 After the rush of Chicago, it is a delight to know that there is a decent British Airways lounge at the airport. 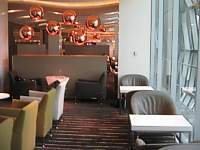 Indeed, there are two, for there is also a separate small First Class lounge, and it is one of the few locations outside London where you'll also find a separate First dining room. However, it pays to go prepared, for at Chicago the setup is a bit odd, but with a really go-ahead BA team who genuinely go the extra mile laying on many more facilities than you might expect for the two (occasionally three) daily flights. For this reason (and the inflight service), many passengers prefer taking the BA flights over the much more regular AA services. For a start British Airways flights from Chicago leave from the new Terminal 5 – a quiet hush & world away from the manic AA terminal. Alas, there is little in this terminal apart from the two BA lounges, which are quite separate, on opposite sides of the concourse. 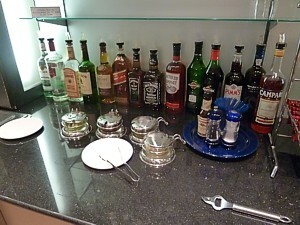 Indeed, the British Airways Lounge Chicago is your only drinking option (apart from the SAS and JAL lounge) unless you want to visit the rather dowdy Host Bar. From the First lounge you even have the delight of boarding straight from the lounge. Many Chicago BA passengers connect from AA, and to avoid the hassle of clearing security again, there is an airside bus transfer from Chicago Terminal 3 to Terminal 5 for passengers going through to Heathrow. It isn't very well publicised, but leaves from Terminal 3 gates G16 and K20 (right by the AA Flagship lounge). It leaves at x:40 and x:10 every 30 minutes, and is even a logoed BA bus, dropping you off at the foot of the M14 jetway. Alas, it doesn't work in the reverse direction. 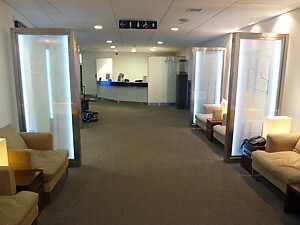 The First Class lounge at Chicago is a little bit like a corridor stuck on the side of the airport terminal. This isn't a bad thing, as it has the joy that the Terraces on the other side doesn't have: windows. Great big floor to ceiling windows. Alas, other than that, it really is just long and thin, with just enough seating for twenty people: twelve in business, and a few more oneworld Emeralds. As a result, it can be hard to find a seat where you're not intruding on other passengers. 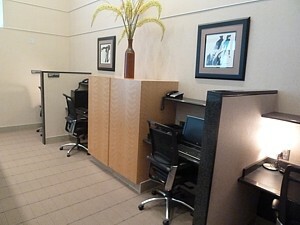 To make it worse, sticking into the lounge is a huge curved wall behind the reception desk. This is used for a bank of phones, which makes it clear how long it is since this lounge was updated. Never the less, there is a very cosy atmosphere in here, particularly when all the BA staff at the outstation gather to wish passengers goodbye, as you walk straight from here onto the jetbridge: a real rarity Chicago, that requires you to hold a special laminated card. 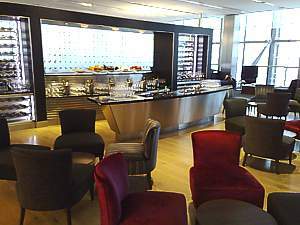 The British Airways First Class lounge in Chicago of course has a bar, which is slightly uprated from the Terraces side. It has a bottle of the same Sparkling Wine you'll find onboard, as well as a couple of other whites, and two very good reds. There is a notably good selection of whisky. The lounge used to have 37.5cl bottles of Veuve Clicquot to help yourself with – alas, these are no longer here. Beer is naturally in the fridge below the counter, and includes some unusual Chicago varieties. 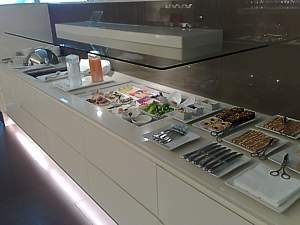 Food in the First Class section at the BA ORD lounge is however restricted to just a few sandwiches, plus the usual slabs of cheese, crisps, packets of Orios and M&Ms and some addictive stem ginger biscuits. This is because in First you can use the First Dining room for full five course pre-flight dining. The First Dining room is however not in this lounge – it's over the concourse and in the middle of the main terraces lounge. To find it ask at the desk and you'll be admitted through the hidden door into a very small room with just eight tables. It's waiter service, but service is very slow. However in this dining room is where the really good wines are hidden, in the small refectory, and here there is also a small guest book. There are two computers in the First Class British Airways Chicago lounge: one by the bank of phones, and one right up at the far end by the jetbridge: this is where there is also a stack of newspapers, so you can get one as you hand in your laminated card, say goodbye to the staff (who line up: I'm not kidding) and you board the aircraft. 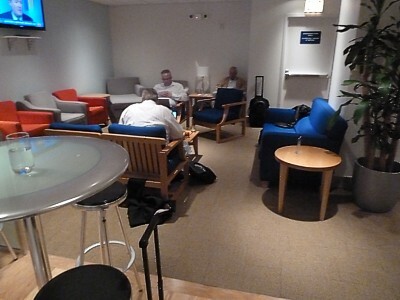 The main Business Class British Airways Terraces lounge at Chicago ORD is both a welcome retreat, and a dingy hole. The main problem is the lack of natural light: not for nothing is it known to regulars as ‘the cave', for that is exactly how it appears, as you walk through a sequence of small underground rooms. Starting at reception, on your left is the Club dining room, then there is a small blank door for the First dining room. Further in are the bathrooms on the right, and then the main room, with 10 or so chairs and the only sofa in the place, and the usual curvy bar at the far end. Wiggle around this, and there are more seats down the corridor, then the computer shelf is straight ahead, left of this is the quiet room, three glass topped round tables, another (wall-mounted) bar, and finally at the far end the TV room, which is where families normally camp out. The bar is surprisingly good, with three good whites in the trough in the middle of the main curvy bar. There are two other bars one in the main room, and one in the back room, which are pretty similar. They are well known because of the unusual types of beer that are stocked, with eight different types of north American oddities, in bottles. There is normally a beer of the month promotion too: not that you have to pay for it. On the counter top are 15 types of free pour spirits, including Baileys, Pimms, Campari, Martini (3 types) Jim Beam, Jack Daniels, and Red Label. 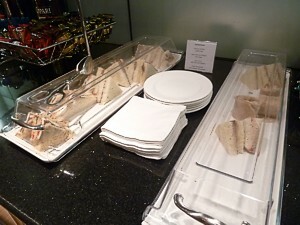 Food at the British Airways Chicago Lounge is great. 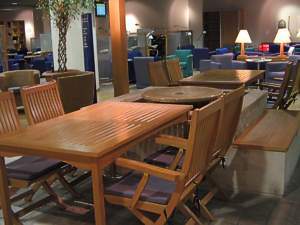 Because the two (or sometimes three) flights from Chicago leave late at night, and land early in the morning, most of them are designated as sleeper services, which means there is a large, good, pre-flight dining room. Indeed, there is a new theatre style kitchen is in place, where you can see food cooked in front of you. 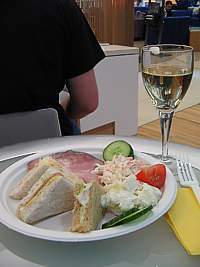 The pre-flight supper can be quite filling, and they also do a nice in Salads as starters. There is also a soup of the day. 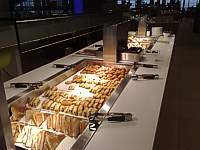 Having said that, if all you want are sandwiches, they are left on the counter top by the main bar, and there are also racks of crisps, cheese, biscuits, and occasionally chocolate bars. Computer facilities are very poor, and obviously and afterthought after the lounge was built. There is one shelf in the back room that has four computers, and a printer. And that's it. You have to perch on bar stools that seem to have come straight from LHR Terminal 5. The computers are fast, but you have to rush to get one: families tend to camp in the TV and leave their children to play on the computers for hours. There is a bathroom in the lounge, but it is as small and dingy as the rest of the lounge. Newspapers are good, with most of the UK selection, and there is also a small magazine rack by the wavy bar, and in the dining room. There is free wifi. 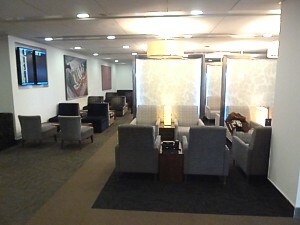 There is a full, dedicated BA lounge at Philadelphia, offering separate First areas, and a pre-flight dining room. It's a shame, then, that the whole lounge complex is such a desolate rambling hole in a distant obscure part of the airport. Even finding the lounge is a problem. From security (use the fast track line if you can - you'll get a sticker on your boarding pass showing entitlement) walk straight ahead down the long terminal wing. At the far end is a lift on the right hand side (hidden behind a pillar). 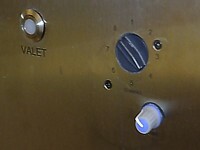 In the lift is a small sign above one of the buttons saying "British Airways". Press this, and you'll go down to the basement, looking rather like a hospital corridor. Turn left, and half way along the corridor are two reception desks - one for First, one for the Terraces. 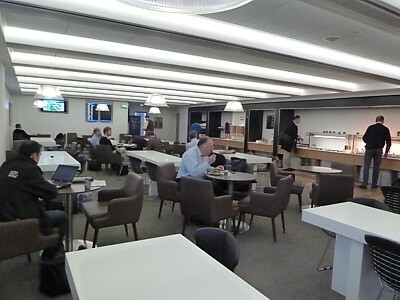 The Terraces in turn splits - to the right of the desk is Club World pre-flight dining room (no access for Golds or Silvers - you only get in with a First or Club ticket). To the left is the main part of the lounge. This goes round in a U shape, with a large island bar in the first half, and a small worktop with food on it further round. As you continue there is a large TV, which always seems to be on far too loud, and at the far end the bathrooms (but no showers). The windows are at tarmac level - so you get a nice view of your plane's nosewheel, plus the distant New Jersey oil plants. 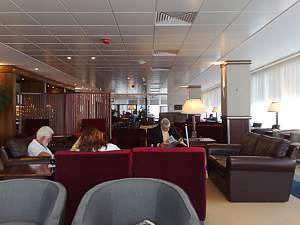 There are two glass boxes in the lounge, which look like smoking rooms, but actually are non-smoking too, and just contain the usual comfy armchairs. In the one around the corner, there is a photocopier, but there are no computers. Food is fairly basic - in the main part of the lounge there are just sandwiches or bags of crisps, plus some fruit (oddly, wrapped in cling film) and packets of shortbread. The Club World Dining Room is where the buffet dinner is served, and you can expect a pretty decent spread of something like shrimp curry, mushroom ravioli, salmon and rice. There is a reasonably good mixed green salad, with cherry tomatoes, carrot shreds, fresh mozzarella balls, etc. Desert gives you a cheese plate, cheesecake, and fruit. It's quiet decent, so if you get in on status rather than with a Club ticket, it's worth trying to nip in anyway - the people on the main desk also have to service the First side, so you can wait until they switch, and then nip across into the dining room. The Bar looks bad, but is up to the standard of most Terraces. There are a dozen spirits on the worktop, and nice trays with lemon slices and cherries etc. There are two white and two red wines at the back, with a description of what the wines are on a menu sitting on the table closest to the bar. In the steel fridge under the bar are bottles of 6 types of beer in bottles; Guinness, Harp, Corrona, Cider, Heiniken, and Boston lager. There are also full sized cans of Bloody Mary mix. Behind the bar is a rack with a dozen or so newspapers on it; there are usually copies of all the UK dailies, plus a couple of American ones like the USA today. Things don't look good when you are hunting for the British Airways lounge in Seattle. After checking in and making your way on the train to the South Satellite, things look a bit grim. There is a small bar here, but not much, and only a small set of stairs with a small BA sign showing the way upstairs to the lounge. However at the top of the stairs, it's as if you have already been transported back to Heathrow. There is a small and very friendly reception desk, and then the lounge wraps it's way around half of the top floor in a great big circle. Business Class is on the right (check out the sun clock projected on the wall as you walk past the corkscrew trees) while First is on the left (through the glass doors). 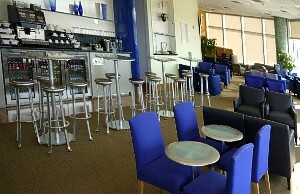 The lounge is small – you can't get away from that – however it has the usual Terraces features of a fountain, a parasol, the standard four high-topped glass tables with wobbly stools near the bar, and plenty of small if upright blue cloth chairs, all overlooking the great view of the airport and runway from the windows. As you walk round widdershins, furniture is more cluttered at the far end with more sofas around slatted coffee tables, and with a TV on the wall above. Finally at the far end of the British Airways Seattle lounge is the library area: check out the books on the shelves – there are some decent coffee tables books on Seattle architecture and history. 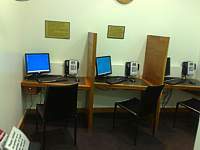 Here are four computers with internet connection in small work cubicles, with small work lamps above them. There is of course free wifi too. The bar area is nothing much to write home about: it is a classic BA bar inset into the wall, with three fridges low down with beer: there is normally one local Seattle steam beer here, plus a bottle of white: red is on the worktop. 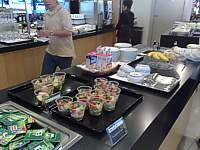 Food is however pretty poor in the Seattle British Airways lounge. There are crisps (Lays, Sun and Bakes) plus cheese and crackers, and plenty of packets of biscuits. Nutigrain bars, and three bowls of fruit. There is a pretty good selection of newspapers and magazines, however these are firmly kept at reception (probably, to stop you walking away with them). There are the UK papers (once the crew from the incoming flight have taken them up) plus German papers (for the Lufthansa flight) and magazines including GQ, Elle, Vouge, Hello, and Men's Health, among others. 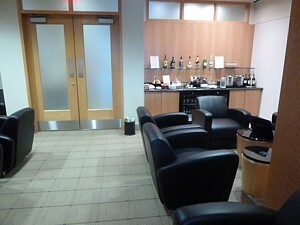 The separate British Airways First Class lounge in Seattle is at the end of the main Business Class section, and is normally rammed with Golds. There are the usual brown leather armchairs which look as if they have come straight from the old LHR Terminal 4 Concorde Room, in an arc overlooking the windows. There is a small separate bar here, but it really is just a few units inset into the wall, with a double bar fridge and a coffee machine. There are some pretty swish looking bathrooms and a showers: rather odd looking, it has a shower head like a flying saucer. Moulton Brown shower gel is in the despencer. 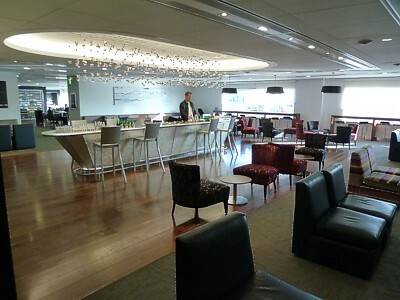 It may seem surprising that British Airways maintain a lounge in Seattle, when it only has one flight a day – and not just a lounge, but a full complex, with both First and Business Class sections, and a lounge that is open for most of the afternoon too. The reason is clear when you enter: there are signs showing that this lounge is also subcontracted to every airline from Lufthansa to Eva Air. 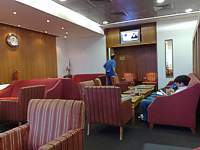 It is also the only decent lounge in the Satellite (if you ignore the small Delta offering), and with the hoards that descend on this lounge, it is clear that BA make a lot of cash from selling the facilities here. Alas, doubling up as the Lufthansa Lounge Seattle means the BA lounge can become crowded in mid-afternoon. 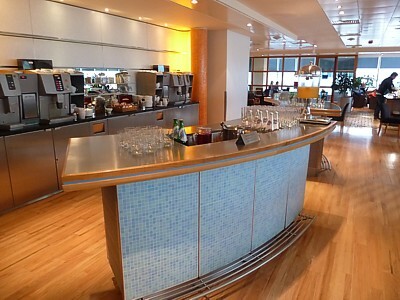 You can however access the Seattle British Airways lounge if you are on a purely domestic American Airlines ticket: after checking in at Councourse A for your AA flight, take the train to the South Satellite, and use your Silver or Gold BA card to get admitance. If you try this trick, be prepared for a bit of a fight, but it can be done. All concourses are connected at post-security, so you can freely move around without having to leave the secured area. The satellites are linked to the main terminal by continuously running underground loop trains. Access for First, Business Class (Club World), Gold & Silver Executive Club, oneworld Emerald & Sapphire, - but restrictions on oneWorld, who are directed to the AA club. The Dallas Fort Worth British Airways Executive Club is a bit of an odd place: a rambling warren of rooms high above the main concourse, in a 'lounge corridor' with lounges for other airlines on each side. 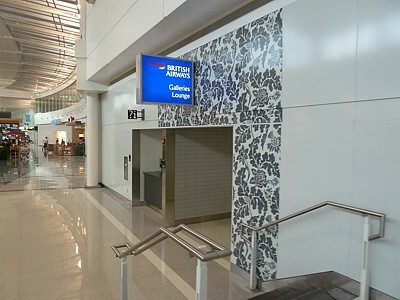 To find the British Airways Dallas Fort Worth Terraces Lounge, check in (or take the airside train) to Terminal D. Then, down the concourse beside the Airport Tigin Irish Bar, there is a large square white tower marked ‘Airline Clubs’, beside the ‘The Club at DFW’ poster. Take the lift upstairs, to floor 5, and along a corridor there is a desk with VDU monitors showing which clubs are open for which airlines. The British Airways and Qantas Club at Dallas Fort Worth is normally Lounge Number 4, so turn right. 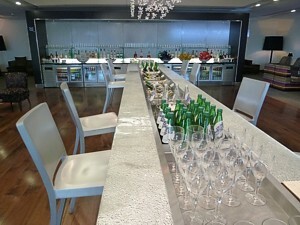 Once inside, the British Airways Dallas Fort Worth Terraces Lounge is a strange selection of connecting rooms, with only the main veranda overlooking the runway having anything other than a boxy feel. Indeed, this light and airy place is the best place to sit, with great seats(of the leather squashy armchair type) and it is right beside the bar. Indeed, the only irritating thing is that seats overlooking the windows and the apron overlook seats with a typical 2+2 arrangement before you can see out of the window. However, before the main evening flights to London, these seats are packed anyway. 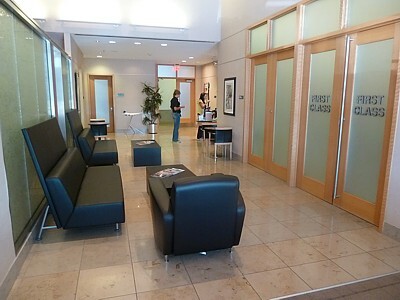 As you walk in, beside the entrance are two long black sofas and the entrance to the business centre. On the left are the frosted doors to business class. Straight ahead is the veranda area, and then as you walk right the bar is on your right, while there is a small box of a child’s playroom on the left. Curve right again and there is a small anteroom area, with a TV high on the wall, and four chairs arranged around a table. Finally, through the door marked 'absolutely no entry' which is normally left open, there is a much larger room – a inner sanctum occasionally reserved for VIPs or special Qantas passengers – with its own bar area, and a whopping allocation of 12 more chairs. This is often the nicest quietest part of the lounge. The atmosphere in the Dallas British Airways Lounge can sometimes be a little odd: far from the comradely you get in many lounges, there is typically a very corporate business like atmosphere with a lot of people going to London not because they can, but because they have to: that is until the new Qantas DFW flights leave, and as the BA DFW Lounge doubles as the Qantas Club Dallas Fort Worth, there is then suddenly a total change of atmosphere with a lot of passengers drinking just so they can get through the next 17 hours on a Qantas plane to Brisbane. 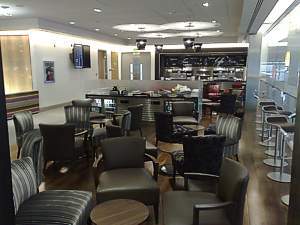 There is a separate British Airways Dallas DFW First Class Lounge within the main lounge: just go through the doors marked First Class only: there are no real restrictions on who goes in here. 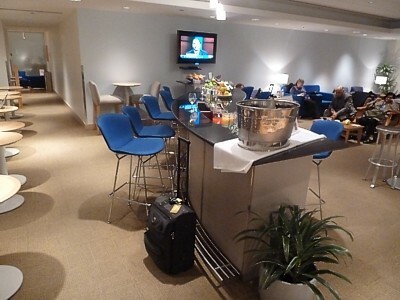 Mind you the bar and food selection is pretty much identical in this part of the lounge. British Airways Dallas DFW Business Class Lounge has a pretty normal BA bar, although the wine is better than you get in many a BA lounge. There are two bar areas: on the inner part of the veranda, or in the inner sanctum. The spirit collection is on a high glass shelf with 16 bottles of everything from Gordon’s Gin to Baileys, Smirnoff and Campari. 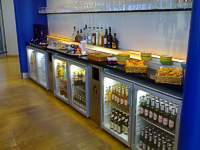 The Beer collection is great in the BA DFW Lounge, with Amstel, Asahi, Bass, Becks, Bud, Coors, Corona, Guinness, Heineken, Miller Lite, Samuel Adams, Sapporo, and Bock. These are all kept in the fridge under the bar area in the bar. And then on top of the bar is the wine. Four types of white are kept in buckets on the worktop, and four reds on the tray next to them. True, the wine could be better, being of the 10 quid down Tesco variety, but it is a pleasant mix of Aussie and US wines, such as Lindemans and Stone Cellars. Food is typically of the cheap, snacky, variety. There are packets of everything from Walkers shortbread to Hummus Dip, Lay’s crisps, and jars of nuts on the counter. There is a small United/Delta-esk salad bar, with carrots and celery for dipping. Finally, there are sandwiches ‘on request’. You have to grab a waitress, and ask for the options which are typically Egg Salad, Roast Beef, Red Pepper or Chicken Ceaser. Entertainment in the British Airways DFW Dallas Fort Worth Executive Club lounge is a bit basic: there are just a couple of old fashioned CRT TVs in the cupboards in the small anteroom, although there is also a pleasant model of a Concorde near reception. Newspapers are however good: there is a fine selection of all the UK papers on the rack, with everything from the Independent to the Mail, plus the USA today, Wall Street Journal and Dallas Morning News. There are some Time, Esquire and Country Life magazines under this rack. 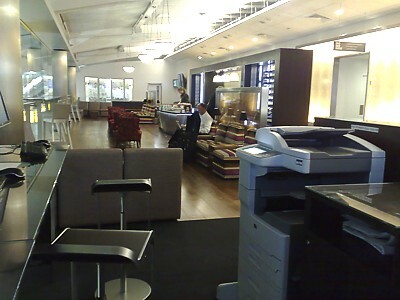 The Dallas Fort Worth British Airways Lounge does have a very good business centre, with four new fast internet connected PCs on desks, each of which have their own printer, and phone. This large roomy space is often the most quiet of the lounge. There is also free wifi in the lounge. Toilets are in the lounge, and there are also basic showers. The British Airways Washington Dulles Galleries Lounge is either a welcome haven at the end of Terminal A, or a tiny cramp cupboard, depending on when you visit. It is certainly small, but despite its size there is a separate First Class section. The BA IAD Lounge is right at the end of the B concourse, just where it turns into the A gates airside. Once through the glass door take the lift to the upper floor where there is a reception desk. 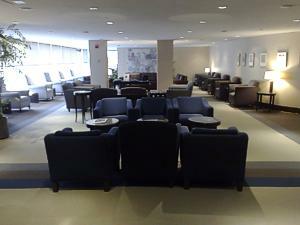 The Washington British Airways Lounge has both a First and a Business Class side at IAD: First is on the right and is very small but with a great view of the runway, while Business is more like a corridor and overlooks the terminal. 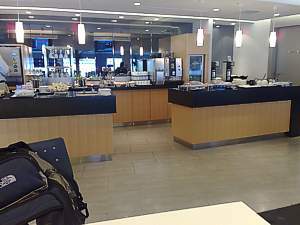 The British Airways Washington Business Class Lounge is like a very small version of the Galleries at Heathrow – along what seems like a long thin corridor, with 2+2 seats on each side. There aren’t that many seats – and it can get packed at peak times. There is of course the typical BA Bar with a fine selection of beer, but only so so wine. The Washington British Airways First Lounge has much better wine – and a First Dining Room where there is pre-flight dining for the late night flights. There are toilets and showers in the lounge – although they are very basic, with just one single stall, and a single toilet. 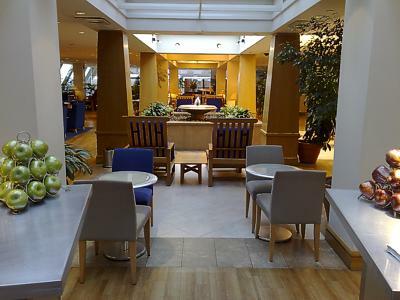 The IAD Galleries is not a large lounge, so a real curiosity of the Washington IAD British Airways Lounge is that Priority Pass is now accepted for entry between 7am and 2pm, before the main BA flights leave (however oneworld status does not count – no access with AA). 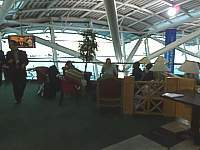 At 2pm everyone is herded out, and the lounge reopens at 3.30pm for BA's three flights to Heathrow in the early evening. 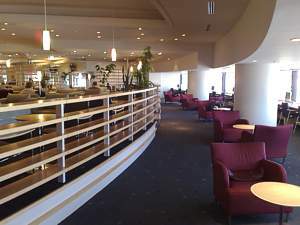 This is a joint Terraces and First lounge, and as such the furniture is a little better than the normal terraces offering, however the food is just the same as normal. It's very clean, with friendly staff. There are eye-popping carpets, and a small glassed in smoking room. There are good big windows with views out over the planes, however as the two daily flights to Heathrow leave late in the evening, you won't get much of a sunny view. It can also get quite crowded, with the two flights leaving an hour and a half apart, and just before the first flight leaves it can get very busy. The World Wine Bar is the usual curvey Terraces style, but with blank panels instead of the usual tiled front. All the wine is South African, in buckets in the trough in the middle of the bar, and they do a fabulous bubbly called Villiera. The Beer is also South African, with Guinness, Castle, Windhoek and Hansa (which comes from Joburg) all in cans, in the fridges under the counter plus plenty of soft drinks and bottles of water. Be warned that none of the drinks are refreshed after the first flight leaves, and if you are on the second flight you may find most of the beer, and all of the wine, has been drunk by passengers on the first flight. Food is nothing special, with packets of crisps and doritos. On the worktop is some fruit, two different types of biscuits, and a large square bowl of black olives. There are rather nasty rolls sealed in plastic packets, with either ham or cheese. There are just two computers, both with very slow internet access. There is a newspaper racks, with three copies of each of the usual UK papers (Times, Guardian, FT, Express and Mail) from the UK and plenty of South African papers. To get to the louge, Immediately after security, bear right towards a lift and staircase on that wall. Go up to the second floor (which is well signposted). 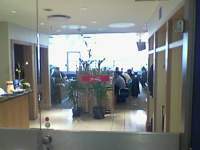 The BA lounge is on the same floor as the SA and Premier lounges. Things have all changed in the past few years at Hong Kong. British Airways now share a lounge in Hong Kong with Qantas, although it really is Qantas themed downstairs in the rather gloomy Business Class section. Upstairs used to be the British Airways terraces, and is now the light bright and airy First Class area. What follows is a brief summary of this lounge. Further details are in the Qantas page, with lounge information for Hong Kong. 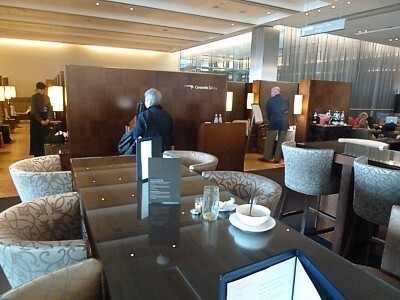 The main section of the long thin Hong Kong Qantas Club is past the large white marble bar. Further on it is generally a lot emptier, with a large central area: on the floor here is a famous rug by Akira Isogawa. On the right are squashy armchairs near a telly, usually on the Australian Network, there's the small business centre, and then an area by the windows which doubles up as a sleeping area with four leather loungers. Finally as you go around in the circle there is a small corridor with more chairs that leads back into the ante room and the bar. And it is the long white bar that dominates this lounge. All the booze is pour-it-yourself, with wine in a square hole on the counter top, with two whites, two reds, and a Sparkling Aussie wine. There is a similar hole in the worktop for the 10 bottles of spirits. Next to this is the beer fridge with Guinness, Tsingtao, and Heineken. Further along are jugs of juice. Finally on the left corner of the bar is the barista service (to 10am only). Food in the Hong Kong Qantas Club is exceptionally good. There are two large tourines with rice and curry plus two hot dumb waiters. Under the hot counters are slices of pizza plus a large salad bar. The computer room has 14 computers. There is free wifi. Showers are the main point of this lounge. Eleven are available. You can get a towel, toothbrush and razor at the desk, but all other amenities are down to an industrial sized tub of Molten Brown shower gel and conditioner in each shower. Newspapers are pretty good in the lounge, with a few English papers (The Times, Mail and Telegraph). Further details are in the Qantas lounge information for Hong Kong page. The Qantas First Class lounge at Hong Kong has also had a revamp, but it's not as swish as might expect, if only because it has strong element of the old British Airways Terraces lounge, which was originally on this location. The lounge itself has a rather staid appearance with classic armchairs around small tables, and slight larger ones overlooking the balcony, which is by far the nicest place to be. There is a great view here overlooking the runway. Setting it all off are some rather fake looking antique paintings on the wall in large gilt frames. 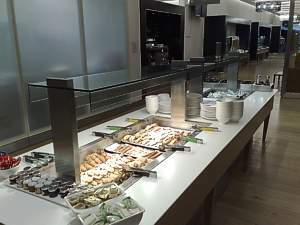 In the inner part of the lounge there are dining tables, and a decidedly slow waiter service: there are also a few food items on the buffet, and a small walk up bar, but if you're in a hurry you might be better off going downstairs to the larger buffet in the Qantas Club. 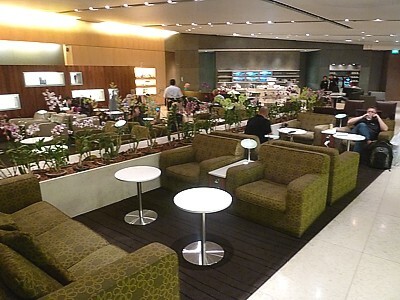 The Qantas Club at Bangkok is actually a British Airways lounge. BA maintains both a First and a Business Class lounges at the new Bangkok airport. These are joint lounges with Qantas, but unlike at Singapore, BA branding dominates. 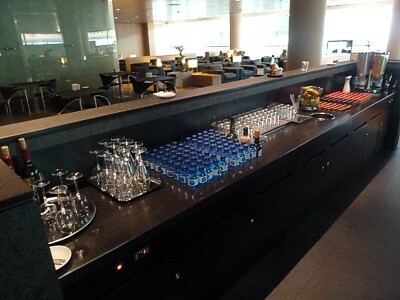 The First (on the left) and Terraces (Bangkok Qantas Club - on the Right) lounges are totally separate, and there is no direct contact between them. Finding the Bangkok Qantas lounge can be a problem: head under the main shopping centre after security, and read the sign by the Priority Pass lounge. This is a delightful lounge, and it's a real pleasure to be in this brand new space. It is alas quite tiny, and shuts early (however the business side is open much longer). 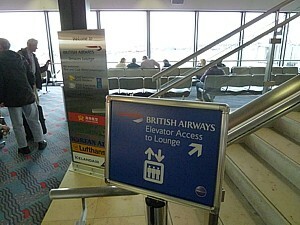 BA Gold members using this lounge under Open Doors access are, oddly, permitted access to the First side. The outside windows aren't much, but there are good views down the terminal. The Bar is absolutely superb. It's at the far end of the lounge. Sparkling Wine is Moet, along with 2 good Aussie whites, and 4 decent reds (normally french). There are 18 different types of free pour spirts, including Johnnie Walker Blue. Food is equally good, with decent salads and soup. Computers are in the L shaped space at the far end of the lounge, with 5 band new PCs. There is a good selection of UK and Aussie newspapers. Showers are at the far end of the lounge. One downside is that annoying lift music plays throughout the lounge. NEWS: The New Qantas Club next door to the British Airways lounge has recently been refreshed, and the décor is much cleaner and sharper than the older BA lounge, which is due for a revamp in 2014. If you're looking for a lounge at Singapore, get ready to be confused. 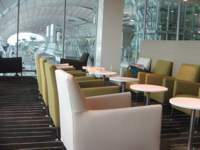 British Airways no longer maintains both a First and a Business Class lounge at Singapore, which were joint lounges with Qantas. Instead, BA and Qantas have done the splits: now that Qantas no longer fly onwards from Singapore to London, Qantas has its own Business Class lounge at Singapore, and BA now use the old First lounge as a joint First/Business lounge. It isn't very good - and the Qantasclub next door is much better. When you are up the escalator, you can turn left, over the bridge, and then straight on to the Singapore Qantasclub, or right and along the balcony to the Singapore British Airways Galleries lounge. The British Airways lounge at Singapore is, quite simply, woeful. A joint Business and First lounge it is straight out of the 70s, with little attention to detail, or even style. It is rather like going into a hotel lobby 40 years ago. There is even an authentic musty smell. 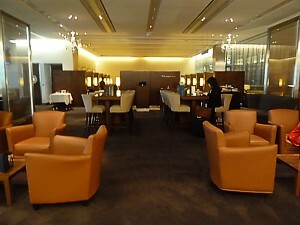 Part of this is because before BA and Qantas parted their ways, this lounge was the Singapore BA First Class lounge. Not now - it takes all comers. Well overdue for a refit, it is almost embarrassing that at such a key interchange on the kangaroo route, there is just not a better lounge. And it gets packed too - when the Sydney to London flight crosses over with its counterpart from Heathrow, and there is the service that starts at the lion city ready to depart too, it can be hard to find a seat. Things get a little easier when the 2005 to Sydney has departed, but oddly, the two London flights depart at the same time (2310, or 2315 for the flight from Sydney). Those seats are also not much to look at - they are leather with a metal frame or sad springy green corduroy out of your grandad's living room, while the bars have a top of a cracked marble. Food is actually worse than on the Qantas side, although the drinks are a little better. However the British Airways Business Class Singapore Lounge is in a good location - the view on the left overlooks the main check in area, but other than a few orchids growing in a line in the middle of the lounge, that's about it. You can't see the planes at all. As you walk in, the food and dining area is right ahead of you, while to the left is the main body of the lounge. Orchids spring up along the middle divider of the lounge, with banks of 4+4 armchairs on each side. At one side towards the end is the 'Sparkling Wine bar' and at the far end a small spirits bar. The quietest area of the Singapore British Airways Business Class Lounge is certainly at the back. As you swing around again and walk along the back wall there is a strange hidden area behind the plywood screen in the middle of the lounge with computers and here there is also the newspaper rack. There are three bars. The main one is on the right as you go in. 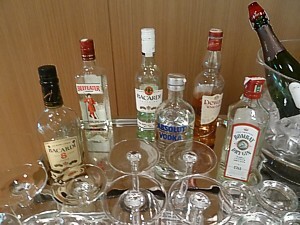 Here there are 10 free pour spirits (Gordon's, Black Label, JD, VSOP, Smirnoff Red, Bacardi, Campari, etc). Beer is just Tiger or Carlsberg, in the small fridge with the flip up door. There are two bottles of wine here in a cooler, and two reds on the worktop. In the middle of the lounge is a vast white table, which is the smallest of the bars. This has a trough running down the middle of it, in which are a couple of bottles of wine, and the only bottle of Sparkling Wine in the lounge is also here, along with three vast urns of juice (orange, apple and tomato). However sitting at this bar is often the most sociable, as people will come up and chat. It's also one of the few places to spread out a broadsheet newspaper. 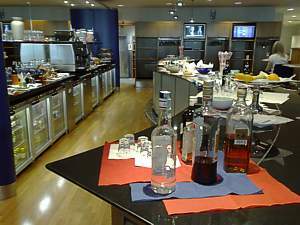 There is a smaller bar at the far end, with a smaller selection of spirits and no wine, but a slightly larger selection of spirits. Food is pretty poor. Forget the delights of the cook-to-order noodle bar on the Qantas side; instead on the round food bar by the door there are some bowls of salads, a tray of cheeses (some of which are actually quite good - check out the tasting notes on the top of the food area), a tourine with rice and chicken, and in a hot tray there are a couple of different types of pizza. There are also 4 glass bottles of nibbles & nuts. At least the lounge has a good selection of newspapers with all of the main UK papers, and all the Australian ones, on a rack in the middle of the lounge. If you want a computer, things aren't quite so good. There are just 5 rather slow computers (each with their own printer) hidden behind the plywood screen in the middle of the lounge. Toilets and showers are in the lounge. 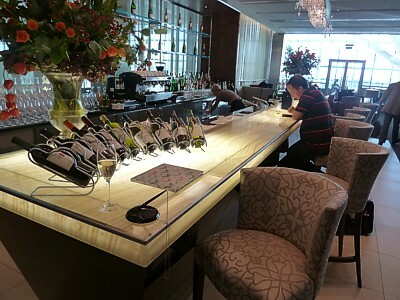 It is well worth while also visiting the Singapore Qantasclub while you are at Singapore. Or indeed, making it your first port of call. The Qantas Club in Singapore is brand new, and is now on a par any Qantas lounges in the world (if only the same could be said for the BA lounge section). The 'old' Business Class side, it got a revamp in 2004, and again in 2013. 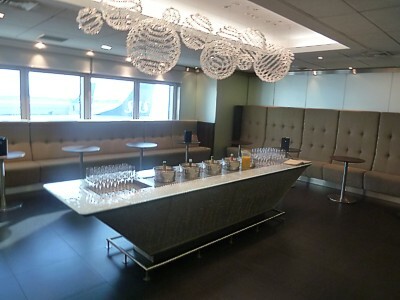 With a fresh, new, innovative design featuring contemporary and stylish furniture and fittings, the lounge is nearly three times larger than the old BA one, with a seating capacity for 400. It's vast, overlooking the main checkin / landside area. There is a great cocktail bar. 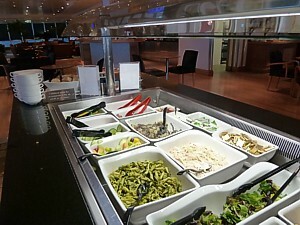 Food is a delight with a cook to order noodle bar, plus the usual Qantas mix of salads and sandwiches, and a hot soup. There is free Wifi, and plenty of computers, with a long rack of them on the right on a long shelf, or near the bar, in cubby holes (which have their own printers). Further details are in the Qantas Lounge page. 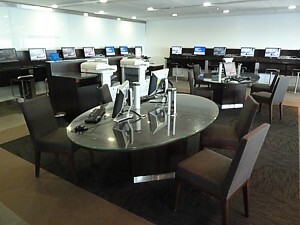 At Sydney British Airways borrow lounge facilities from Qantas for the once a day flight. To find the lounge, once through security take the escalator beside the change counter next to the Oyster bar. Business class is left all the way along the shelf like balcony: the lounge entrance is at the far end, while First Class is on the upper floor, normally at least three lounge dragons carefully vet anyone who tries to come in. Beware that this place can get packed in the afternoon before the early evening flights depart. 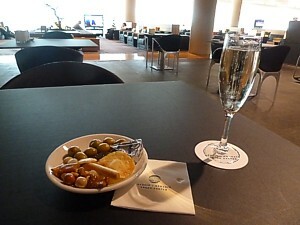 The Sydney International First Class lounge is absolutely superb: it's up with some of the top lounges of the world. It's right on the top floor of the airport, and occupies a new space that juts out over the apron, giving fantastic views. 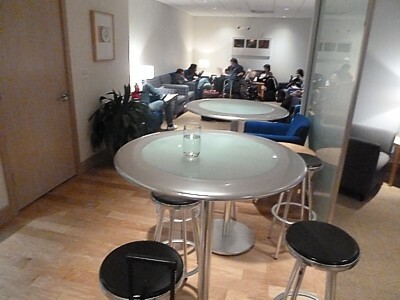 The lounge itself is divided up by wooden partitions, so it doesn't seem as big as it is. It's a classy place, full of white marble and rather uncomfortable designer chairs. As you come in the dining area is on your left, and the library (and mobile free zone) is on the right. The bar is absolutely top notch. with a fine selection of pretty much every spirit you'd like, and with decent Sparkling Wine. Food is equally good. There are menus (by Neil Perry), and you have to ask the staff for what you'd like. A firm favourite before the long haul to Heathrow is eggs benedit with salmon. 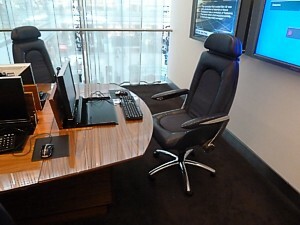 There are state-of-the-art business facilities with 11 Computers, and complimentary wifi internet access. Around the back there are luxurious individual marble-lined shower suites with individual stereo volume and lighting controls. 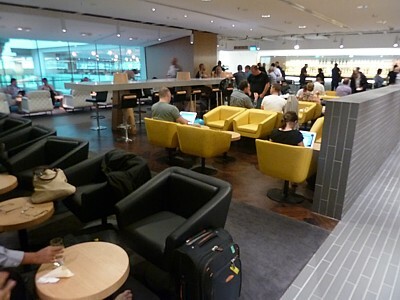 Further details about the BA First lounge in Sydney are on the Qantas Sydney Lounge page. 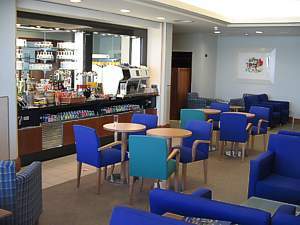 Downstairs from the First Lounge is the very much downmarket International Qantas Business Lounge, which is used as the British Airways Business Lounge in Sydney. The lounge itself is very long and narrow, and the view is spectacular with amazing views of the runways and even distant views of Sydney. 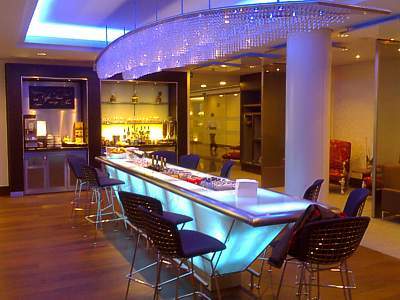 The entrance in the middle of the lounge; right in front of you is the bar area with nibbles and multiple wine coolers. As you go left there is plenty of seating, the food area, another bar, yet more seats, and at the end a family area. 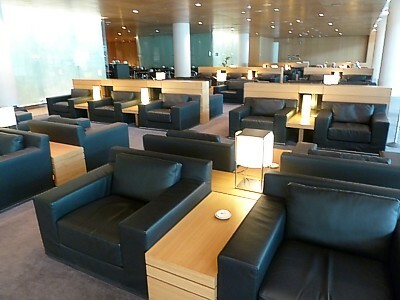 This is a quiet area, and where you can find five loungers if you want a sleep. If you walk the other way there is a coffee bar, another bar, and finally computers at the far end. 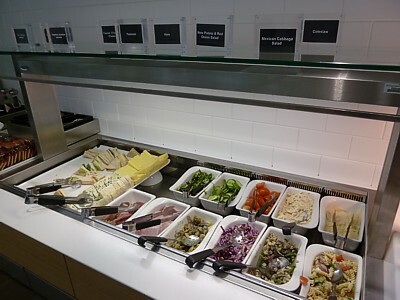 The food offerings include an OK buffet, with several hot options generally including curry and chicken done various different ways: you can eat quite well before you get back on the flight to Heathrow. There is also a very good salad selection many different types of dips and spreads. There is even dessert, with chocolate brownies and cheesecake. 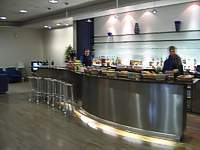 Before the main rush of flights leaves the wait staff often come around with nibbles, such as meat balls or canapés, generally at 3.30pm before the afternoon BA flight departs. There is one other food delight in the lounge: the new gelato station. The bar is good, and the long white bar should be your port of call, with three whites in coolers in the table top plus a sparkling, while reds are on the table top. The other two self serve bars have a delight rarely found in airline lounges: cider in draft! It is Magners, along with Cascade and Stella Artois., while in the fridge are bottles of beer (VB & Tooeys) and a soft drink fountain with Coke. 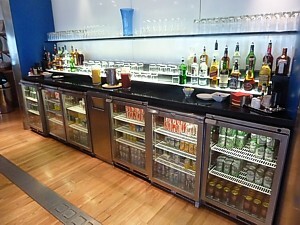 There are very good Business facilities in the Sydney British Airways Business Class lounge. On the extreme right hand side of the lounge there are ten iMac computers that run both Mac OS and Windows. There is free Wifi in the lounge – select Telstra, and then click in the Qantas Logo. It's very fast. There are power points in the main seating areas, but they can be a bit hard to come by: they are on the window side of the low polished stone walls. There is a magazine rack next to one of the triangles, with the SMH, Australian and Financial Review, but with no UK papers. 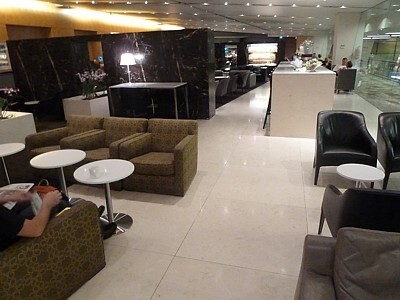 Further details about the BA lounge in Sydney are on the Qantas Sydney Lounge page. This lounge used to be a dediated BA Terraces lounge, and despite its small size, it did the job well. 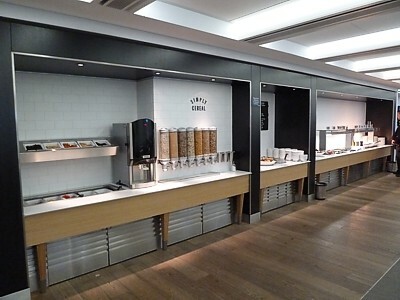 However recently BA have sold the space to Northwest Airlines (and in turn now Delta), who have created a large new lounge for all the Skyteam airlines. Exceptionally unusually, normal BA Terraces access rules apply, which means there is full Open Doors access for Gold BAEC members, and access on an economy ticket for those with a Silver card. You will be offered a lounge invitiaiton at check in. You don't need it to get in, but it is well worth while taking it, because finding the lounge without is a nightmare. There is not a single sign in the airport pointing towards the lounge. Instead, head to gate 14, and find the tiny lift hidden in the alcove in the opposite wall, and then press the button for the Air France lounge. At the top is the lounge checkin: The large plasma screen behind the desk shows a BA logo in the mornings, and a NWA logo in the afternoon (theoretically, to avoid confusion, although few are convinced). The lounge opens on the dot of 9am. The brand new lounge is clean, lovely, with lots of light, plenty of pine, white walls, and windows that look right over the gates used by BA. Also overlooking the gates are the computers, which are ranged about the windows. These are Macs, and and again are brand new, although the location can be a bit distracting. On the raised area there are some vast white leather armchairs which are fantastic for a snooze - the red ones on the lower lever are rather more uncomfortable. There is just one bar with the food area infront of it, on the left hand side are you go in. 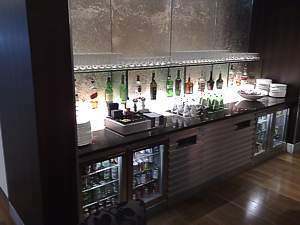 There are 2 beer taps (including Sapporro) but alas, unlike the rest of the lounges at Narita, no beer machines, 8 spirits in free pour bottles, 2 reds on the worktop, and 3 whites plus a Sake in coolers lining a trough on the island bar. There is a great soft drinks machine (if you can read Japanese), and a coffee machine too. Food is great, with a good selection throughout the day. From the time of the first BA flights, there is breakfast, with cerial (such as cornflakes, in weird Japanese packets) & muffins. Then lunch appears by about 1pm, with 2 types of soup, with pots of salad in plastic cups, and sandwiches which are really yummy. By mid afternoon there are cakes & pastries. 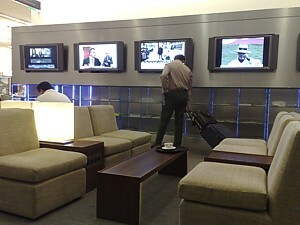 Around the lounge there are 3 plasma TVs jointly showing departure times, and also a TV programme: one has CNN, another a Japanese station, and the third a rolling advert for NWA. Oddly, newspapers and magazines are very poor. There are copies of Time on a small coffee table by the front desk, and that's about it. The bathrooms and showers (three) are down a long thin corridor at the far end (left) of the lounge. Down this corridor there are eight telephones (which are rather cheap and nasty, looking as if they were designed by committee), which are often unused. 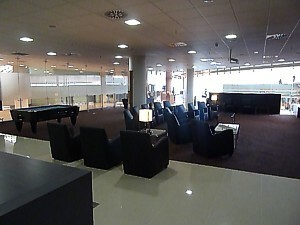 If you fly British Airways from Barcelona you get access to two separate lounge in the sparkling new hub of Terminal 1. It is a vast improvement from the old woeful 1992 el Prat, to the new el Prat Airport. 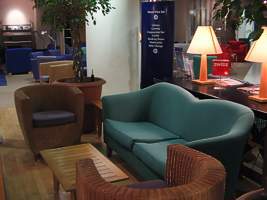 The old el Prat Gaudi lounge is no more, and now there is the Barcelona Sala VIP Miro Lounge or the Aena's Pau Casal Lounge for British Airways passengers in Barcelona. You're much more likely to visit the Miro lounge on BA flights, as it is on the non-Schengen side, after passport control, but if you have a while at the airport, do try visiting the Pau Casal lounge on the Schengen side too: shopping is much better here, and it is probably a good bet if your partner plans to do some retail therapy, as the shops are better in Schengen, while the booze and food is better in the non-Schengen lounge. You need to make a decision about your lounge hopping plans before passport control through. Straight after security, you either take the escalator down to the Schengen area, or you turn left, along a balcony, and present your passport for Non-Schengen. Access is with a Club Europe ticket, or with the right Frequent Flyer card. You can also get access with Priority Pass, or just by paying 25 euro on the door. The non-Schengen lounge at Barcelona Airport has a huge plus over its Schengen counterpart - it has a pool room, cinema, a better bar, and even a golf driving range. There are deep leather airmchairs around the sides with power sockets (euro sockets only) in the tables between the chairs. The fun area of the lounge is to the right of reception, with two pool tables, a huge projection TV, and the mini golf driving range. 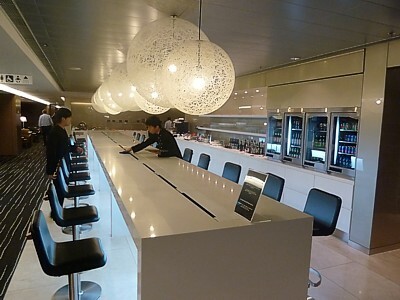 There are two bars in the Sala Miro Lounge at Barcelona Airport (AENA contract lounge). 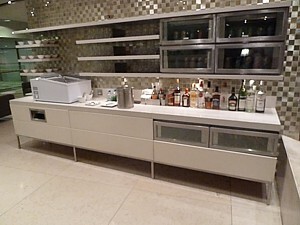 There is one long counter, with fridges in the middle of the lounge that have wine in a bucket. It has spirits on a tray, and sparkling wine. If you want real Sparkling Wine you either have to grab a waitress or ask at reception. There is also a vast display of alcohol on the shelves on the wall. Unlike the other lounge, you can drink this (but if you do, blow the dust off the bottles). Food is ok. There is cereal and cold croissants in the morning, along with Jam & butter. In the evening there are a few sandwiches. Throughout the day there are muffins &donuts in the glass cabinet. Right in the middle of the lounge is the sleeping area, with six day beds in the semi darkness. Computers are quite good, with a two new Macs in small work pods close to reception. There is a printer, fax, and free wifi. Full details of Aena's Barcelona Sala VIP Miro Lounge are given in the Iberia Reviews Section, including a full photo gallery of the lounge. 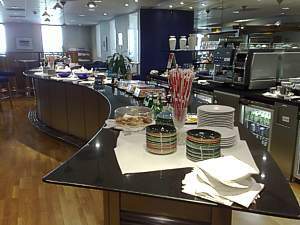 If you are on British Airways from Barcelona, you do get access to the Schengen lounge too. Don't go through passport control. Instead, once through security, take the escalators into the main airport area (Called Sky Centre), take a sharp right, and then go up the escalator or lift. The lounge itself is a lovely open room looking down on the main shopping centre with a sleeping compartment in the middle, and a bar on the far wall. 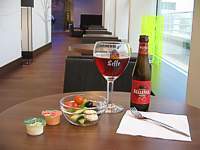 There are two bars in Aena's Pau Casal Lounge in Barcelona, one in the middle of the lounge with beer and wine, and cans of soft drink, plus a smaller counter at the far end that has spirits on a tray, and sparkling wine. Notably, the wine section is not refreshed in the mornings. There is also a great display of alcohol on shelves on the wall, but - the bottles on the wall are strictly for decoration only. Food is pretty poor. In the mornings there is cereal, and cold croissants, along with Jam & butter. By mid afternoon there are muffins &donuts in the glass cabinet, and finally in the evening there are a few sandwiches. Computers are quite good, with a four new Macs in small work pods in the other half of the lounge from the bar, however there are only four: it can be a hassle getting a machine, and there is no printer. There is a charge for wifi. 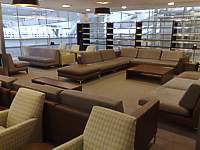 Full details of Aena's Barcelona Sala VIP Pau Casal Lounge are given in the Iberia Reviews Section, including a full photo gallery of the lounge. The British Airways lounge in Nice is a disappointment. 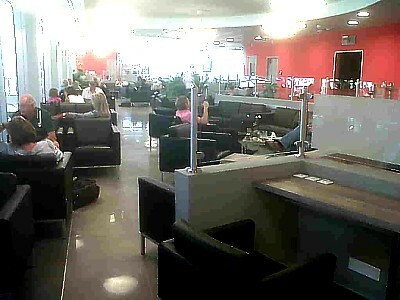 It is a third party lounge, and as such lets in all the Priority Pass passengers from Nice (normally on Easyjet) too. When Emirates flights are leaving, the lounge is a real squeeze. 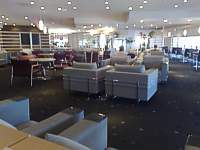 The lounge is run by the Chambre de Commerce et d'Industrie de Nice Côte d'Azur, and you get the impression they just can't be bothered with people who want to leave the area, seeing the state of the four lounges they run (which include the miserable Cap D'Antibes and Club Cap Ferrat (Known as the Ferret Club to ex-pats) over in Terminal 2. The biggest problem with the lounge is that it is in the Non-Schengen side, so if you are early you have to wait for the sole passport controller to lumber along, wake up, and then finally glance at your passport before you are let though to the small holding pen where the lounge is. Beware that in this gate area, you can't get out, and there is only one cafe and a small shop. A pleasant experience it is not. The British Airways Lounge Nice is on the first floor, served by a very slow lift: this allows the receptionist to size you up as you very slowly inch up to the lounge, however they seem to let in pretty much everyone: there is little number control, so long as you have your Club Europe boarding card, or Executive Card to hand. In theory they print out lists of passengers before hand, so they can greet you, but they are generally incorrect. And then you're into the lounge... which is massively underwhelming. 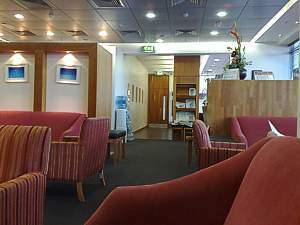 It is rammed with leather armchairs, and very small formica coffee tables (of a dentist waiting room style), with a few curved glass barriers to add to the atmosphere. The view, such as it is, is of the inside of the terminal building. Food is poor, to non-existent. There is a tall plastic tower with mini-pizza squares and onion tarts. This is next to a microwave, so you can warm them up (turn the time dial to the right in 5 second intervals to heat it). There are also small slabs of cheese in plastic, a few sandwiches, and a big vase filled with small bitter tasting olives. The bar is marginally better in the Nice British Airways Lounge. There are cans of beer, eight bottles of spirits (including Beefeater gin), and Sparkling Wine on request. To get at this, you have to disturb the snooze of the lounge cleaner by tapping on the mirrored window, and ask for Pink or Normal. You'll have to do this in French too, as they don't understand any English. Supposedly, you are only permitted one glass, but there seems to be no restriction on refills. Newspapers are woeful. There are just a few French papers, and that is it. On large letters on the papers there are signs warning you that you can't take them out of the lounge. There is theoretically free wifi in the lounge, however you have to ask at the desk for the password, and it rarely works. 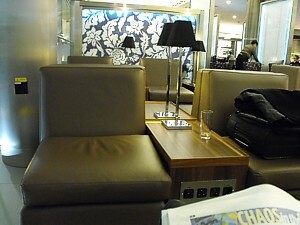 All in all, the British Airways Nice Lounge is better than being outside with the great unwashed, but not much. This lounge used to just be used by Flybe, but now that Aer Lingus has been thrown out of OneWorld, BA use this lounge for its flights to LGW, while for all other flights to LHR on Aer Lingus codeshares with BA status you must use the decidedly more spacious Gold Circle Lounge. You go up the stairs, and turn right where the bmi lounge is on the left. The lounge has recently had a revamp, and is smaller than it was, which means the lounge is rammed with furniture. It gets very busy when the Finnair (which also use the lounge) flights are leaving in the evening. There is a large dining table, four or five seating areas, and TV high up on the wall. There is an OK view of the runways from the seating area by reception. The loos are outside the lounge, and shared with bmi. You need a doorcode, obtainable from reception. There is one bar, directly infront of you as you go in. There are cans of Guinness, Heiniken and Bud. The wine is poor - one white in the fridge and one red on the counter. If you want Sparkling Wine it is an eye watering €25 for a mini bottle. Spirits are on optics, with Cork Dry Gin, Bacardi, Conac, Jamesons and Vodka. In the fridge are mini cans of Tonic, Fanta, Coke and Diet Coke. There is a Bewley's coffee machine. Food is poor, however there are hot scones in the evening. The butter is in the mini fridge on the right of the coutner - along with slabs of cheddar. There are 4 types of crackers, a bowl of other biscuits, and the lovely Elite Chocolate Kimberleys. There is also a bowl of rather manky fruit and Walker's crisps. Around the far corner there are three free internet computers in the business centre and a photocopier. No fax. Alcohol is banned in this area. Newspapers are on a rack by the door - where the reception can keep an eye on you. All the papers have a large sticker stateing that they cannot be removed from the lounge. 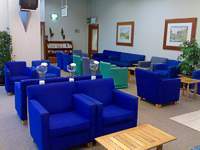 If you have access to this lounge you also have access to fasttrack at Dublin. From the BA checkin desks walk all the way to the other end of the terminal, find the small hidden fasttrack queue hidden by all the blokes in shellsuits, convince the guard you should be allowed though, and then once through walk all the way to the other end of the terminal where the lounge is again. You may decide not to bother. The lounge closes strictly on the dot of seven, even if your flight is delayed. 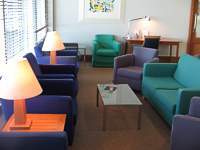 Toulouse Blagnac contract lounge "Salon VIP La Croix Du Sud"
NEWS: The Toulouse Blagnac contract lounge Salon VIP La Croix Du Sud has undergone a major revamp, and is now much larger and better than it was. 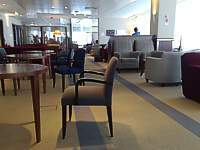 The lounge at Toulouse Blagnac is pretty dire, as Airport Lounges go. It is not even operated by a separate company, but is instead part of the council run airport. It's spent a fortune on natty logoed cups - and little to go in them. Rather like Blagnac itself, which is a tiny rural airport, which would be ignored normally if it didn't have the really big guns of the airport world calling in for the vast airbus factory opposite the tiny terminal. 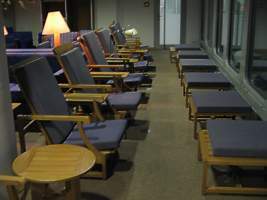 If you are on the Gatwick flights, finding this lounge is a bit of a struggle (as is check in, thanks to the ex-Easyjet staff who now man the counter). Go to the far end of hall C, around the makeshift barriers, all the way back, past security, and then in the tiny holding area before passport control go left, left again, up the concrete stairs with no signs, along the walkway with a plywood door halfway along. At the far end is a sign saying Salon VIP La Croix Du Sud You have reached a haven of peace, because noone else can find it. It is known by the ex-pat locals as the Crock of Sudds. The lounge is a tiny little box of a place. 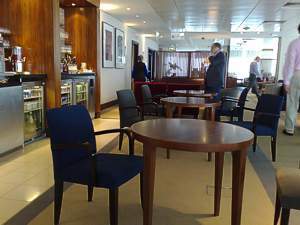 The only lounge at the airport, it takes in everyone from Priority Pass to BA executive club members, to the French Frequent Fliers. 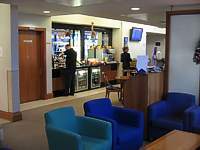 As is the normal format for contract lounges, you walk in half way through to a lounge that has two halves: but each side is idential. On each side there are identical rather hard armchars, around three tables. Each side has one computer with free internet access, and a very odd French keyboard, on a worktop on one side of the room. On other sides of the room is a fridge (in the wall) with the self sevice bar. In here are several good bottles of white, and quite exceptional Sparkling Wine. There are also several beers, including Blanc and Kronenbourg. On the small bar counter there are a couple of bottles of red, and the self-serve spirit bar, which is pretty poor. There's a bottle of whisky, vodka, and a random spirit on optics screwed to the wall. Food is amazingly poor, with just peanuts and biscuits. There are no newspapers, other than the local Toulouse freebie. There is also a coffee machine. The lounge in Cairo is a contract lounge - usually it is used by Egyptair, and it is one of the most extraordinary of pretty much any airline anywhere, if only for it's decoration. Alas, it is also dry. 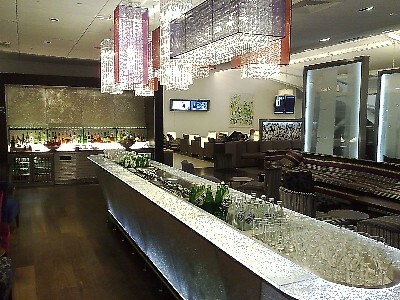 When you check in make sure you get an invite to the lounge (this also gets you 10% off your duty free). 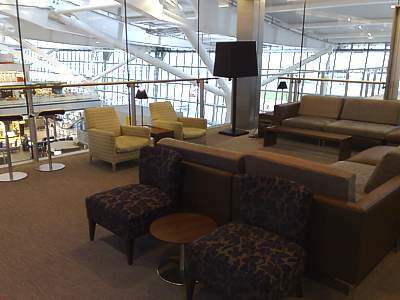 The lounge is hidden on the top floor of the terminal - take the lift up to where the coffee shop is, and then hand your invite over at the desk. The lounge itself if separated from the main part of the airport just a rope, so it really doesn't feel very special at all. 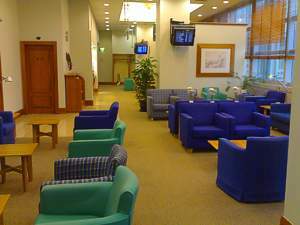 Egyptair has themed the areas of the lounge according to the countries it flies to, from the Paris lounge, to the English quarter. There are two main areas for the lounge - you can sit outside, under the modern glass ceiling, or there are the VIP rooms. These are extraordinary. They look like a French palace from the 17th century. Food is pretty poor. There are a few pastries and sweetmeats, and bags of crisps. There are however plenty of flunkies running around, so if you ask for the crisps they are brought to you - on a bone china plate. 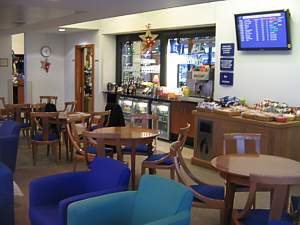 The lounge is dry, so there is no alcohol in the lounge - however you can pop down the unmarked back stairs to the bar in the main part of the terminal. Here, a beer costs 20 Egyptian pounds. There are no computers or other facilities in the lounge, but there are a couple of TVs which are normally on CNN.